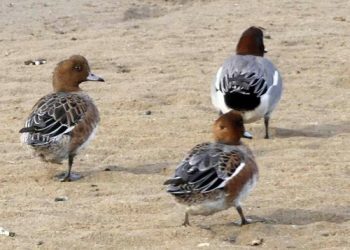 Wigeon are generally known as winter visitors to the UK, although in some places, mainly in Scotland and the north of England, some are established as resident breeders. 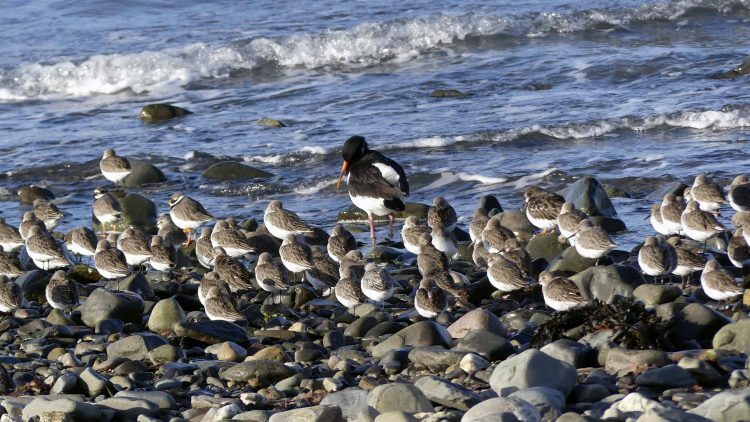 The birds begin to arrive back in their wintering grounds in the British Isles as early as September. 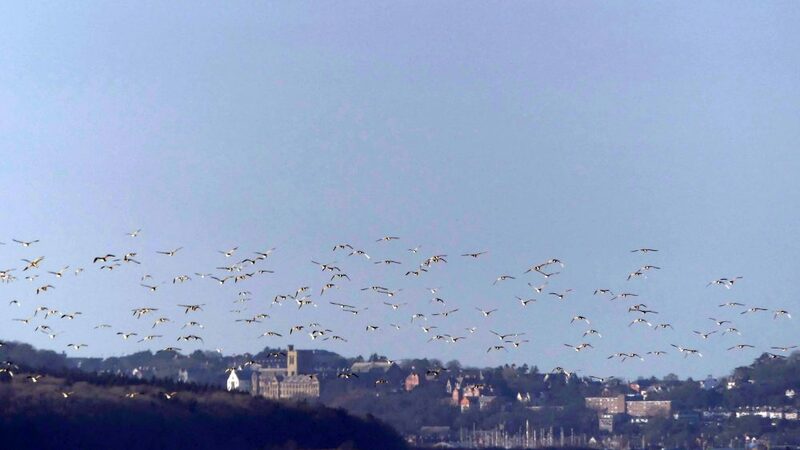 The influx continues through October and November and by December the BTO estimate that they number around 440,000 birds. 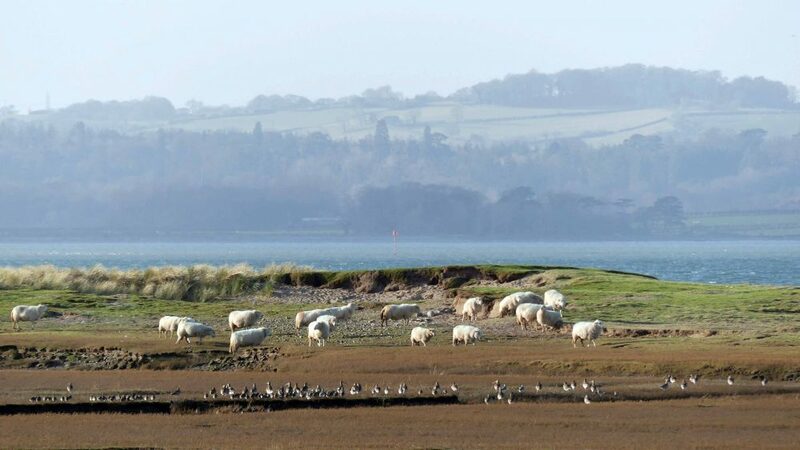 They gather in spectacular vast flocks mainly in coastal locations, moving inland at dusk to crop the grass in fields and meadows, but some winter inland, in flooded districts and on large lakes and reservoirs. 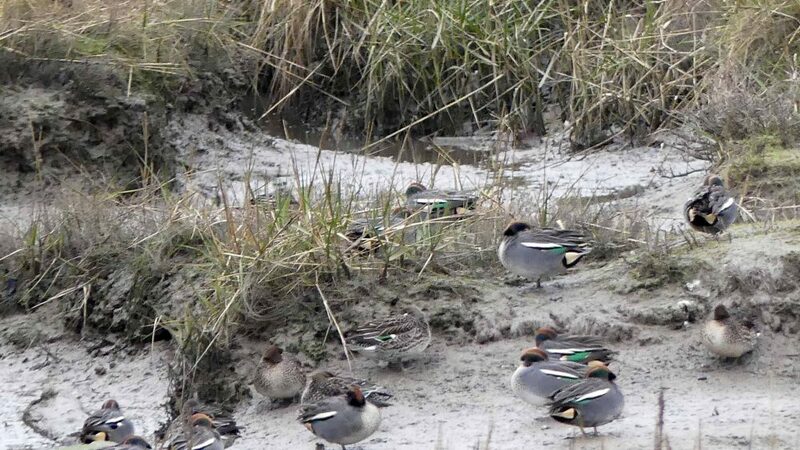 Highly gregarious birds; flocks of Wigeon hundreds strong rest by day on estuaries and mud-flats. 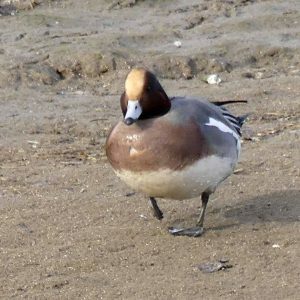 The Wigeon drake is one of our most handsome ducks. 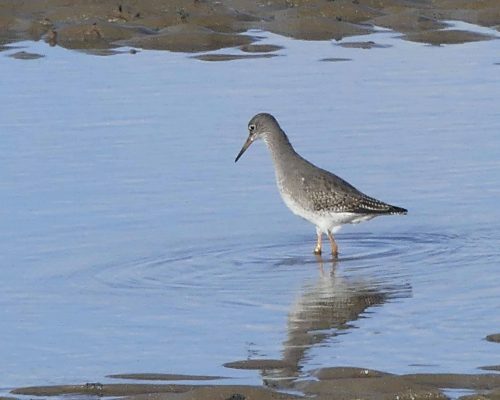 Medium-sized and distinctively shaped, the head is dark chestnut with a wide creamy yellow stripe extending from the base of his short blue-grey bill upwards between the eyes to the crown of his head. The body is softly patterned grey, the chest pinkish-brown, the underbelly is white and the rear end a contrast of black and white. 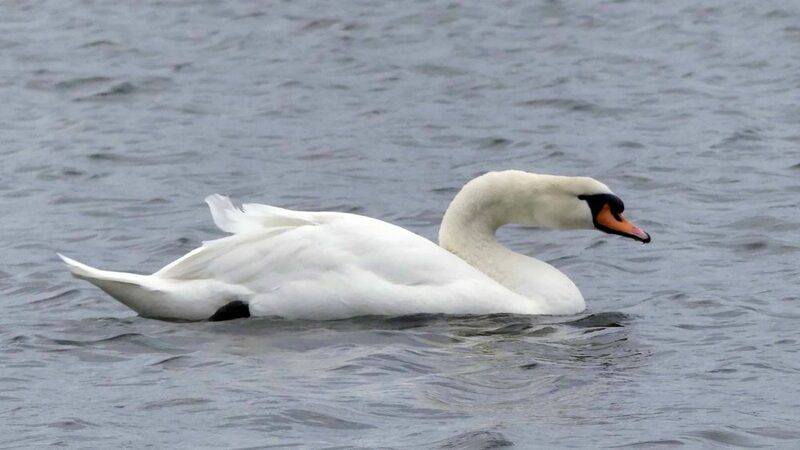 The wings are pointed and in flight he reveals white shoulders and green wing patches. In eclipse plumage (June-October/November), the male resembles a dark female, but with the white forewing. 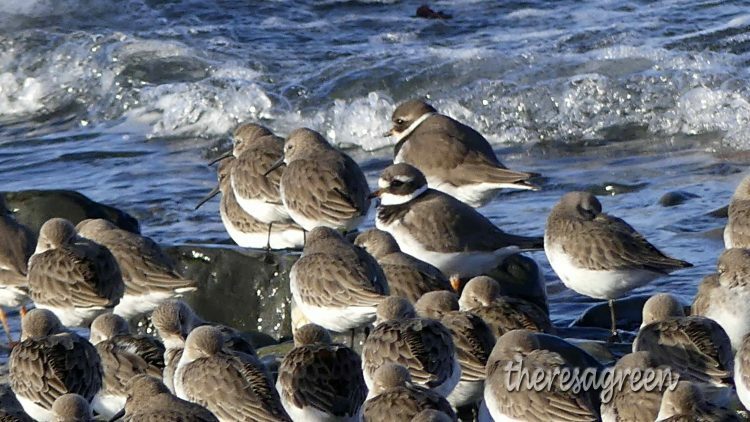 Immature males lack the white shoulders of the adult. 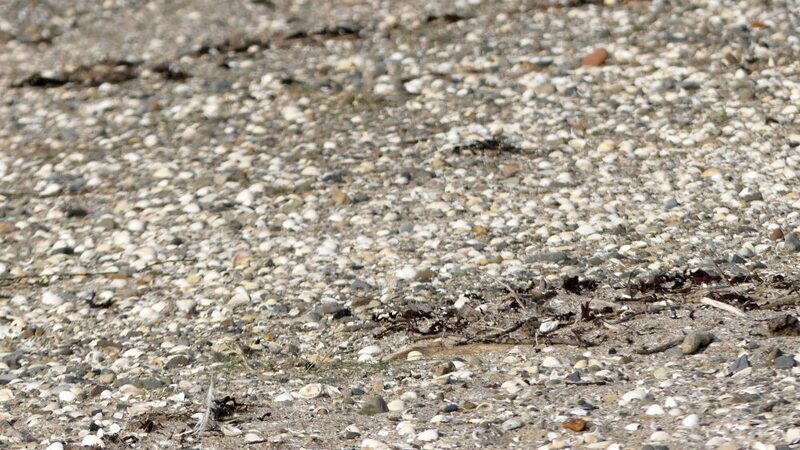 Similarly distinctively shaped, females are more subtly attractive, being more uniformly brown than females of other species. 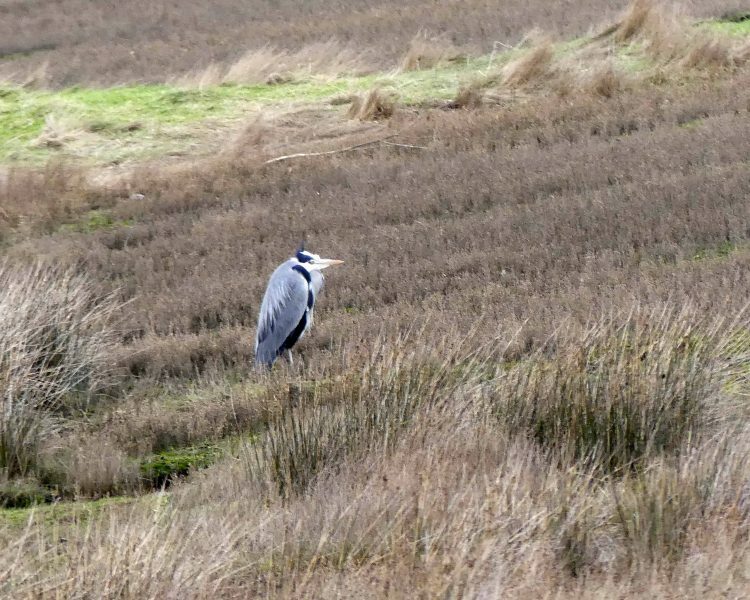 They are slimmer and have a more pointed tail than a female Mallard. 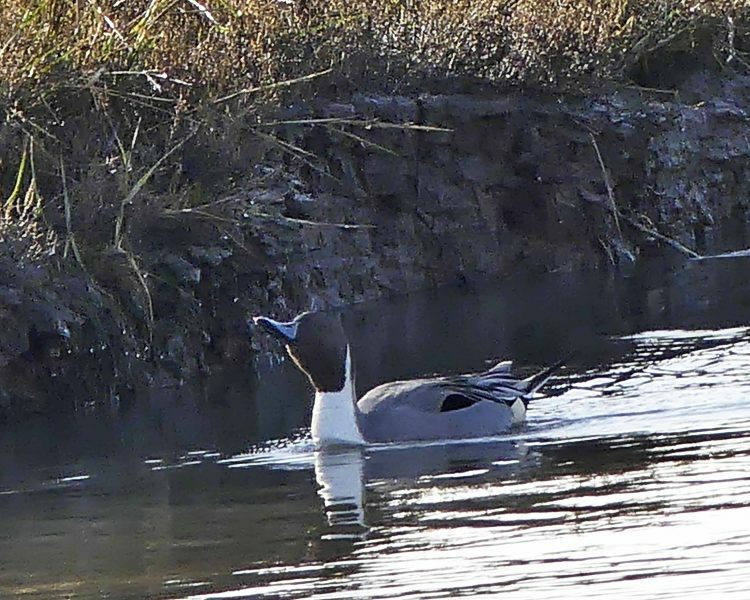 As the male, they have a high forehead, but the head is a darker chocolate brown and the bill, still blueish, is smaller than the drake’s. 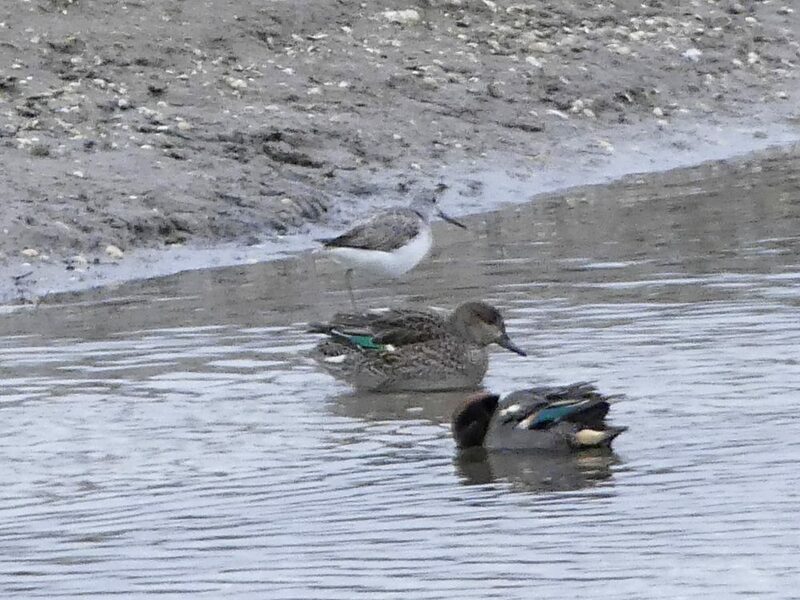 Her back is patterned brown, she has a greyish-green wing patch visible in flight and a white belly. 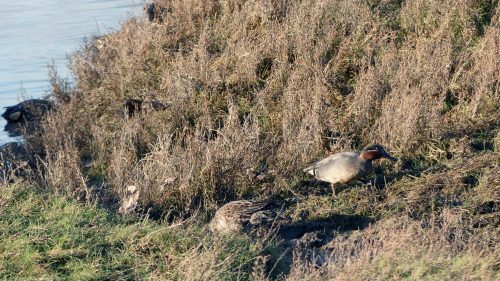 Wigeon are lively birds and the whistling of the drakes and low growling, or “purring” of the ducks, which don’t quack as other species do can often be heard when several birds are together. 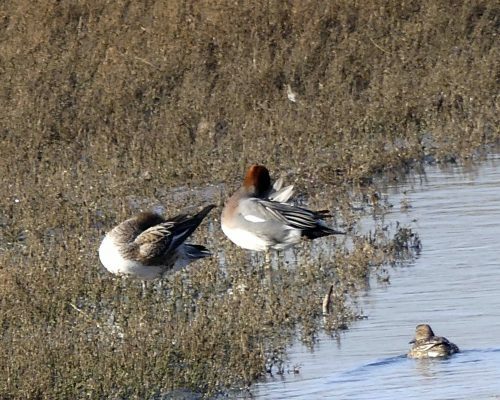 Wigeon are classified as dabbling ducks and are closely related to Mallards, Shovelers, Garganey, Gadwall, Pintail and Teal. 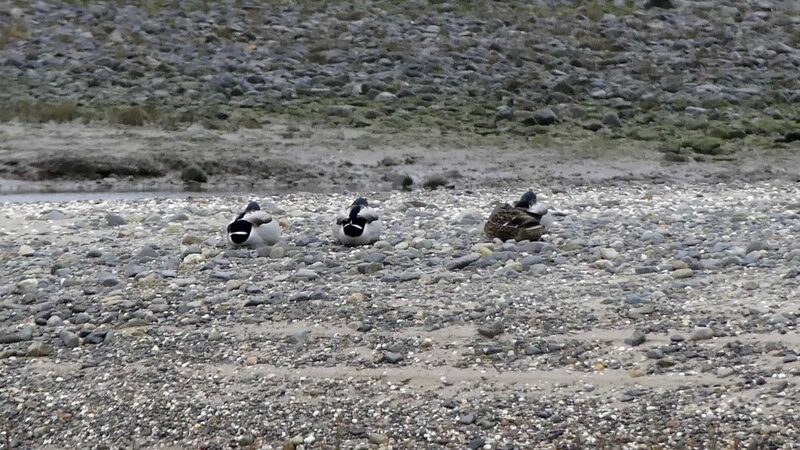 But they are unusual amongst ducks as they spend much of their time out of the water, where they graze in waterside grassy areas, rather like geese. 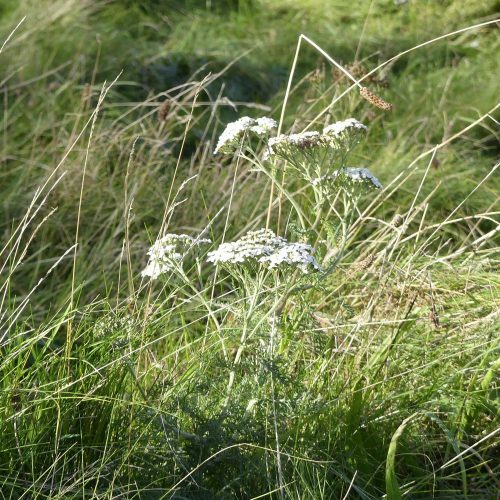 Wholly vegetarian, their diet consists mostly of leaves, shoots, rhizomes and also some seeds, which seem to be what those in the photographs above and below are stripping from the grass stems. 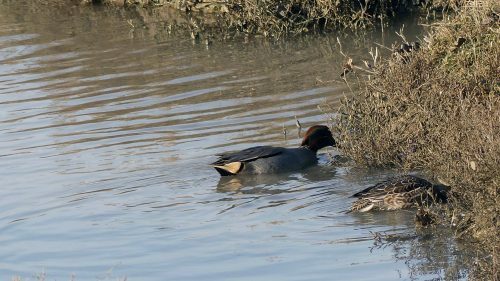 The ducks do spend time in the water where they also feed on waterweed, occasionally dipping ‘bottom’s up’ as their cousins do. 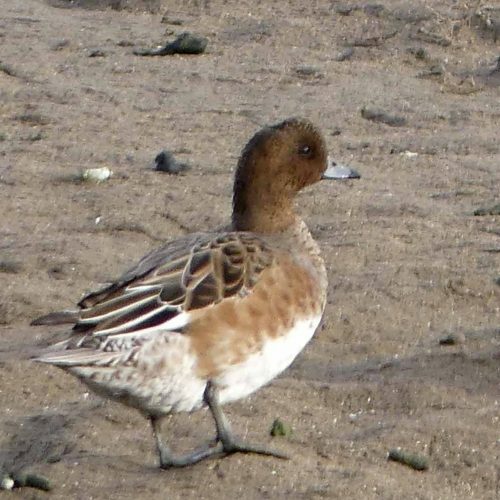 The first Wigeon’s nest found in the UK was in 1834, in Sunderland. 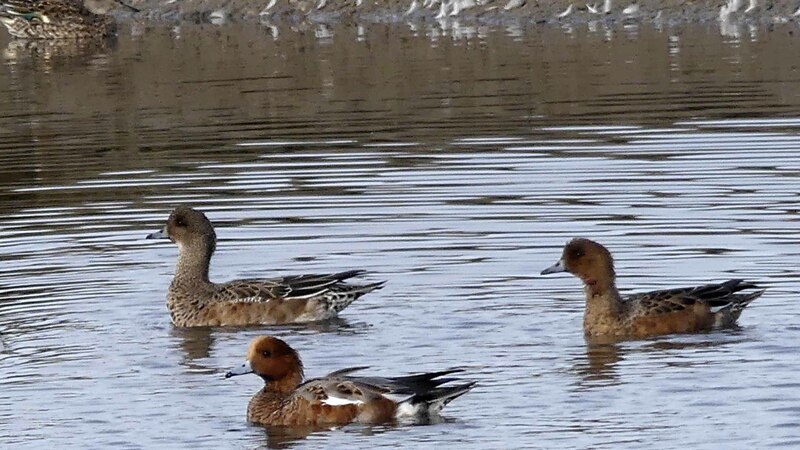 During the early 1900s Wigeon were expanding as a resident breeding British species, but by the late 1960s this came to a halt and there was then no regular breeding south of Yorkshire. 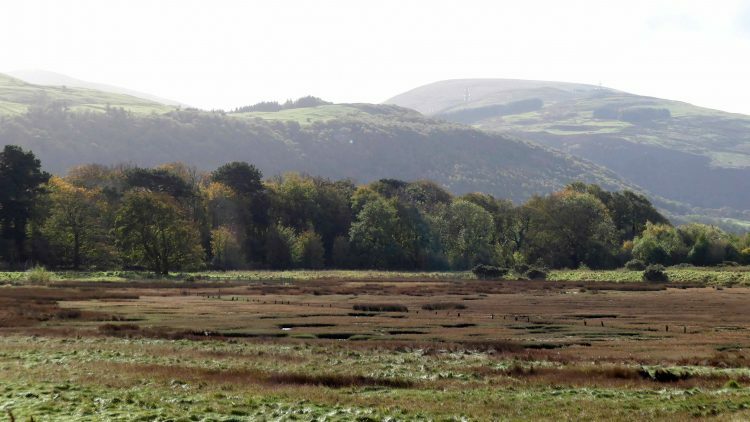 The habitats they favour for breeding are lochs, rivers and marshes, especially those in wooded countryside, although they do occasionally nest on coastal marshes. 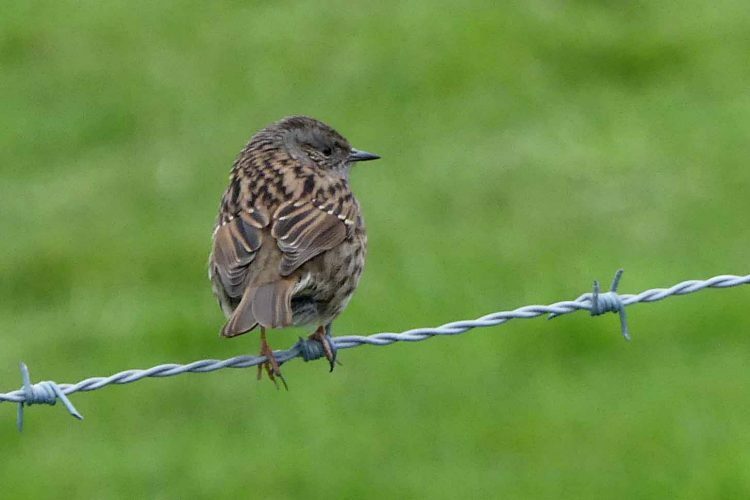 The BTO estimate there may be somewhere in the region of 400 breeding pairs, mainly in Scotland and northern England. 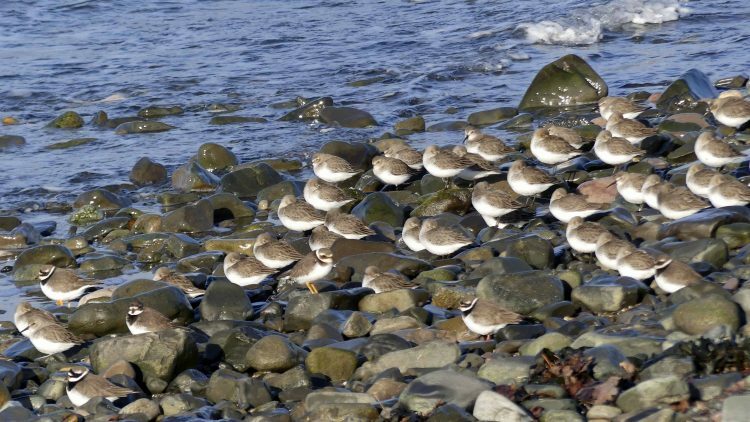 Their habitual breeding grounds are in the far north, in Iceland and throughout a wide Arctic and sub-Arctic belt that runs west from Norway across Asia to the Bering Strait. 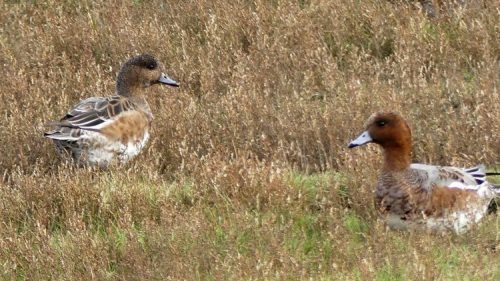 The scientific name for the Wigeon as given by the BTO is now Mareco penelope (prev.Anas penelope) The more recent name derives from both Brazilian Portuguese: marréco=a (small) duck and Greek: penelops=a type of duck. The RSPB and bird books show the previous scientific name of Anas penelope. 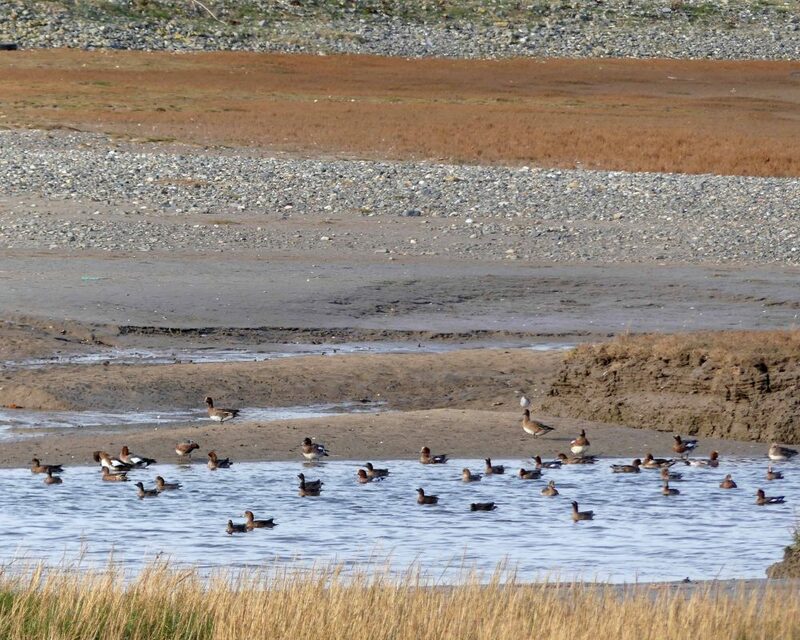 Wigeon have been recorded in the British Isles since the Mediaeval times of the 16th century. According to the eminent language expert Professor Walter William Skeat, the name was then spelt “Wigion”. 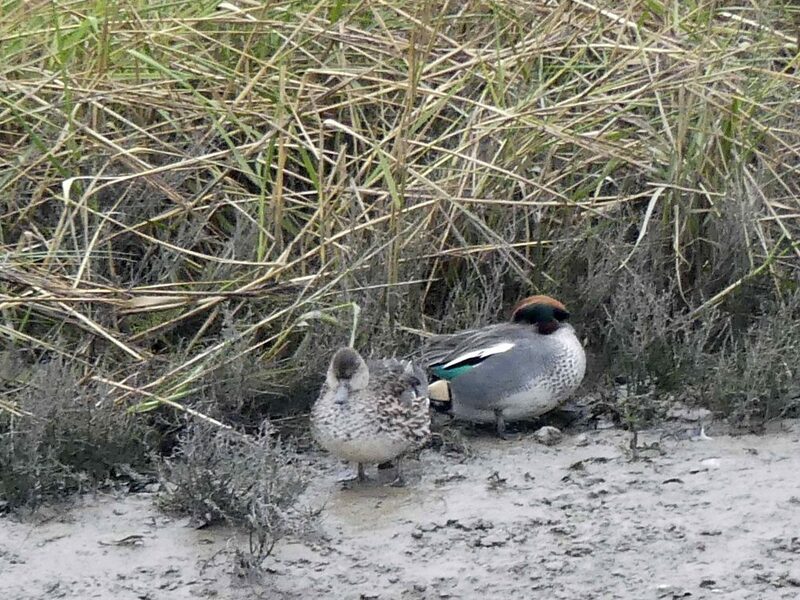 In 1767 Gilbert White in his History of Selbourne recorded seeing “multitudes of Widgeon and Teals (which) in hard weather frequent our lakes in the forest“. 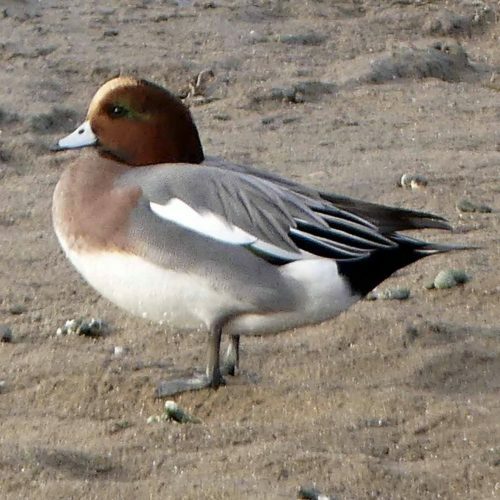 It is still referred to as “Widgeon” in one of my old nature books that was copyrighted in 1934. In another which is not dated, but titled “Birds of our Country & of the Dominions, Colonies and Dependencies” that must be of a similar age, the author refers to it as Common Wigeon. These days it is commonly known simply as Wigeon, or as Eurasian Wigeon. 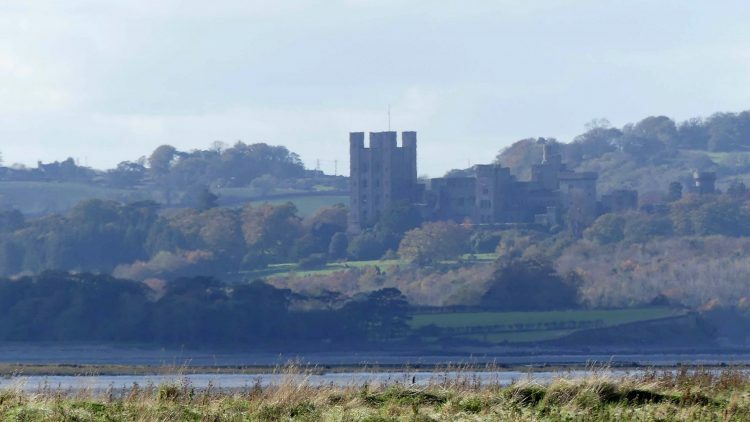 The Old English names are much more fun and evocative, most of them originating in Norfolk and the East of England or in Northumberland where historically the birds have wintered in their thousands. Whew; Whim; Whewer and variations of these such as Pundle-whim and Pandled Whew, are all thought to have come about from the bird’s whistling call. 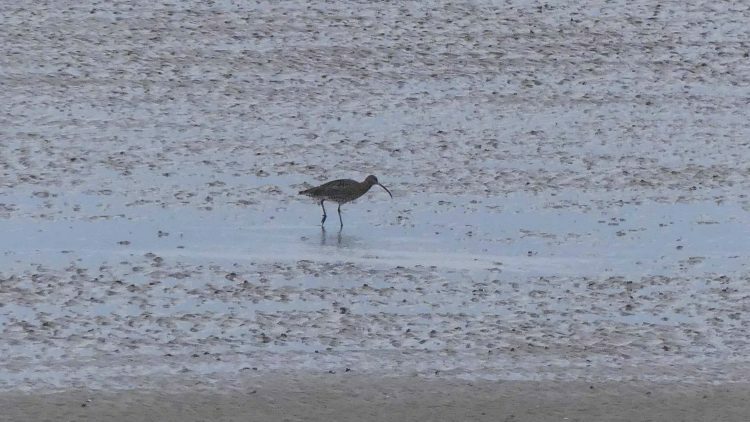 “Whim” equates to whistle, as in the name of the Whimbrel, which translates as Seven Whistlers. I think the Welsh “Chwiwell” also derives from the bird’s musical call. A “pandle” or “pundle”, is a winkle, which it was thought the ducks collected as they fed on bottom-living water plants. Another old name is “bald pate”, referring to the broad cream crown stripe and “lady fowl” – I’m not sure about that one! 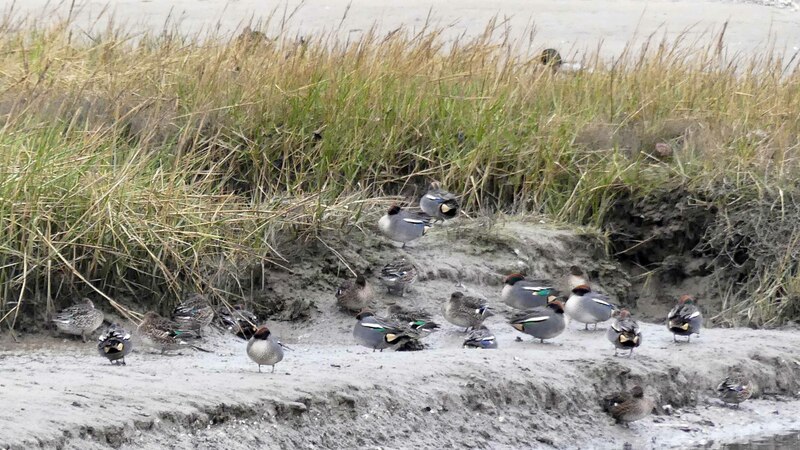 The collective name for a flock of Wigeon is a Bunch. 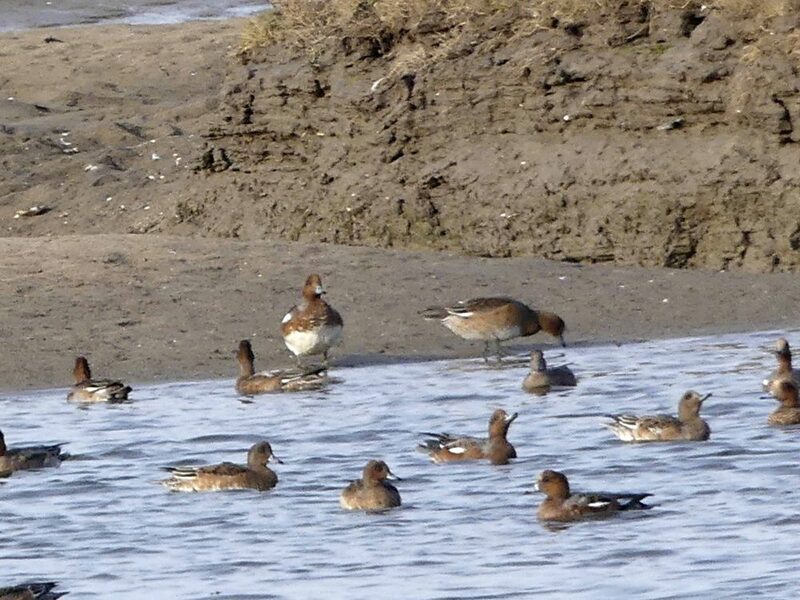 Wigeon have long been hunted for eating. 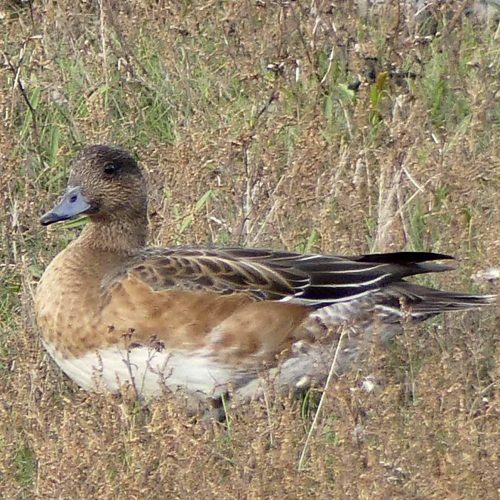 I read that historically, Wigeon were easy prey for wildfowlers, which may be why in the 18th Century the name also came to be used for a stupid person. They may not have always been the first choice of the hunters as according to my trusty “Birds of our Country & of the Dominions, Colonies and Dependencies” – They are not the nicest to eat, for they sometimes have an unpleasant fishy taste, although at other times they may be excellent. 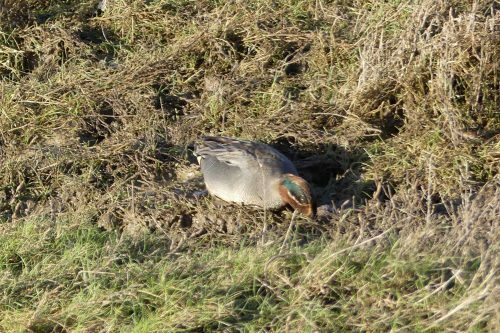 As with Wild Geese, which are always very ‘fishy’ when they first arrive but rapidly improve upon a diet of British greenstuff, the flavour of the Wigeon varies with its food. 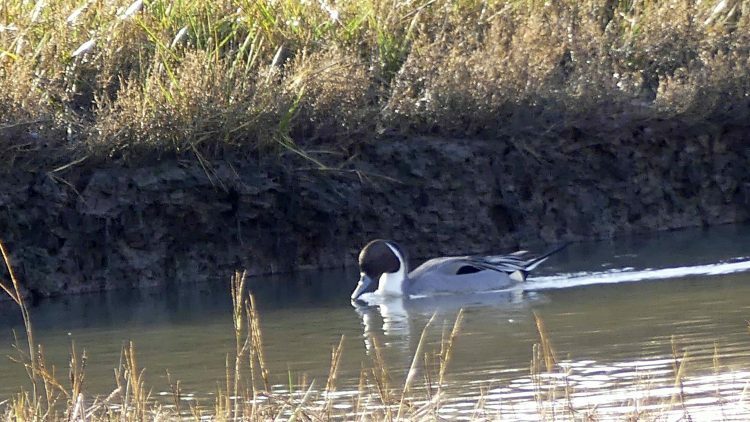 That prompted me to research current legislation on the hunting of wildfowl and learned that within the designated shooting season, Sep 1 – Feb 20 in England, Wales, Scotland & Northern Ireland, it is legal to shoot Wigeon. 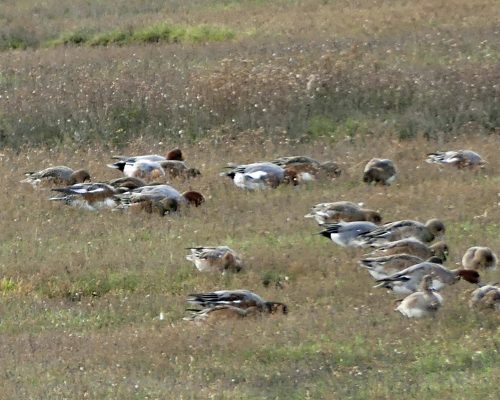 I was surprised to see that: I naively assumed that birds’ with an Amber conservation status, which Wigeon have as a species with declining numbers, that they would automatically be protected. Clearly not. 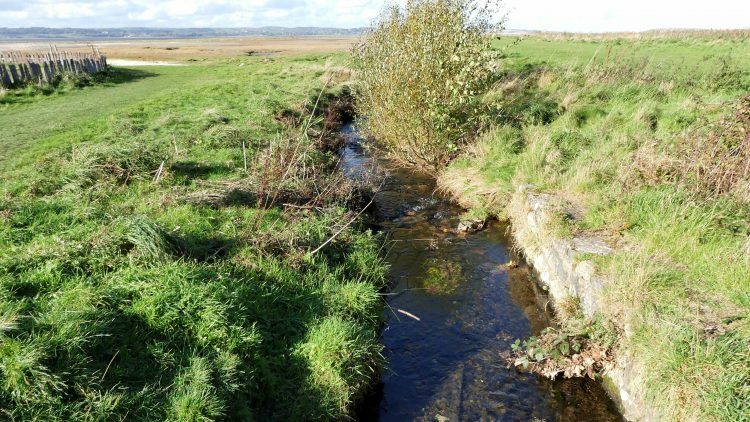 It is also permitted to shoot Gadwall, Goldeneye, Mallard, Pintail, Pochard, Shoveler, Teal and Tufted duck. 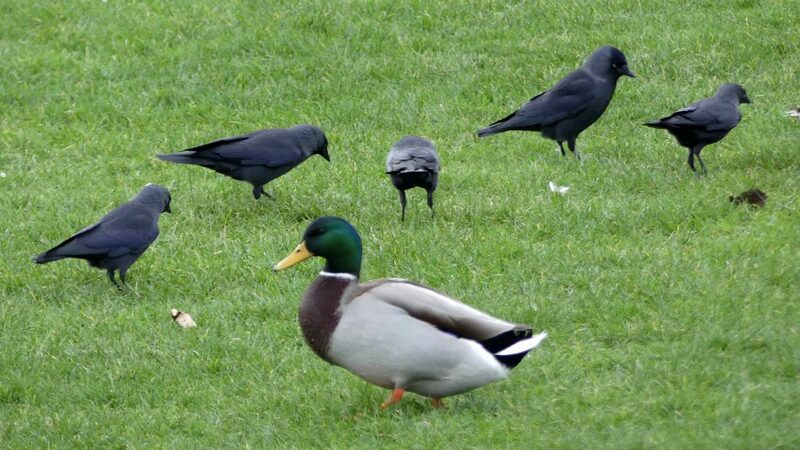 I knew shooting Mallard, the classic Wild Duck, was approved and had my suspicions about Teal, but as for the rest, how does that fit with our horror at our European neighbours that shoot other migrating species of birds? I don’t suppose anyone knows how many ducks are shot in the wild each season, but game shooting is becoming an increasingly popular sport and without its feathers, who knows what you might be eating in a trendy restaurant with Wild Duck on the menu? 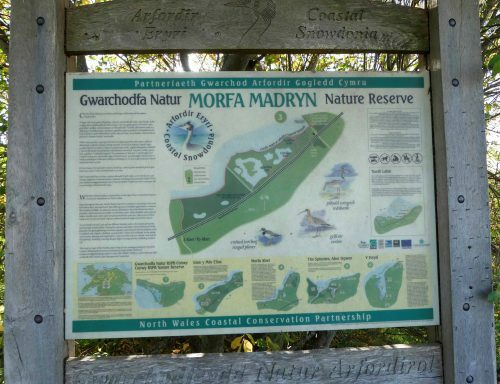 I had never been into the Morfa Madryn Reserve before, so I thought I’d take a quick look around it while I was here. 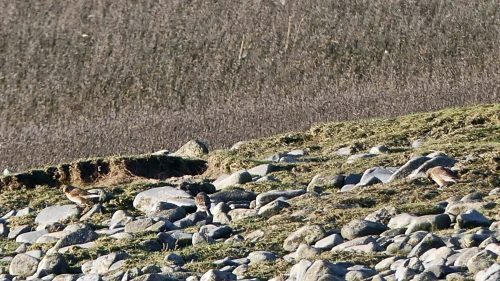 As are most bird reserves, this one is furnished with hides, three in fact, that will have been carefully placed to maximise views of particular aspects of the reserve. 13:34- I came upon the first of the three hides, opened the door cautiously and ventured inside. This was partly to see if there was anything to see from there that I couldn’t see from outside and partly to have somewhere to sit for a few minutes out of the cold wind. I have to say that I’m not a fan of bird hides for several reasons: 1) If I’m alone I dread opening the door in case there’s people in there watching something rare and I upset them by scaring it away. If I’m with someone I always get them to go in first. 2) If there are other people in there I never know whether to speak or not. 3) I’m not good at sitting still for long periods of time, especially on hard wooden benches. 4) I worry about opening up hatches in case they either break or I can’t do them up again. 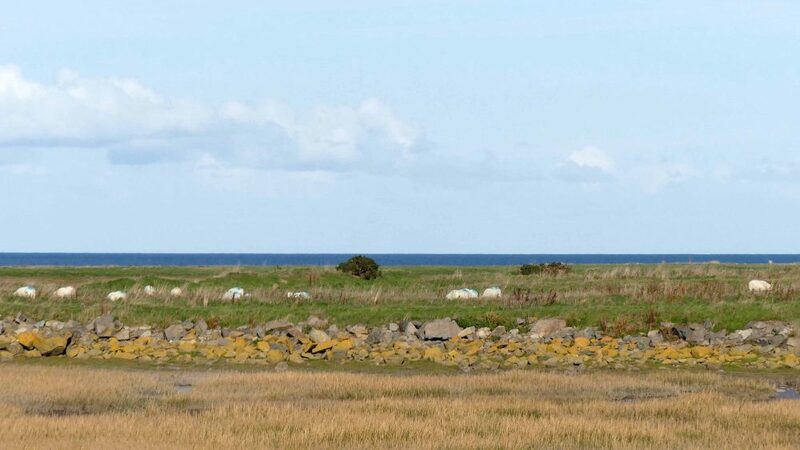 5) I confess that I get bored looking at the same view for ages, especially if I’m supposed to be waiting for something to put in a rare appearance that may only last for seconds. 6) I rarely have binoculars with me, so feel like a fraud and can’t really see if there’s anything there to watch unless someone kindly points it out to me. 7) I think about what I might be missing outside. 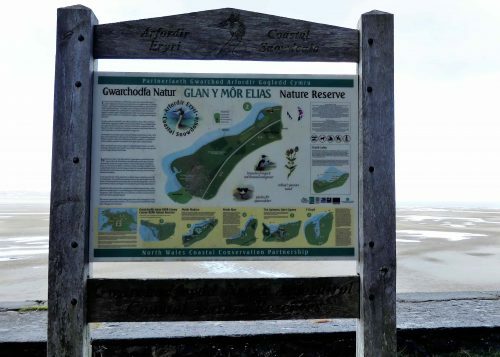 “The tide’s way out so not much to see in the way of birds, but the views across the sands are spectacular: it’s rare to get such clear views of the Anglesey coast. 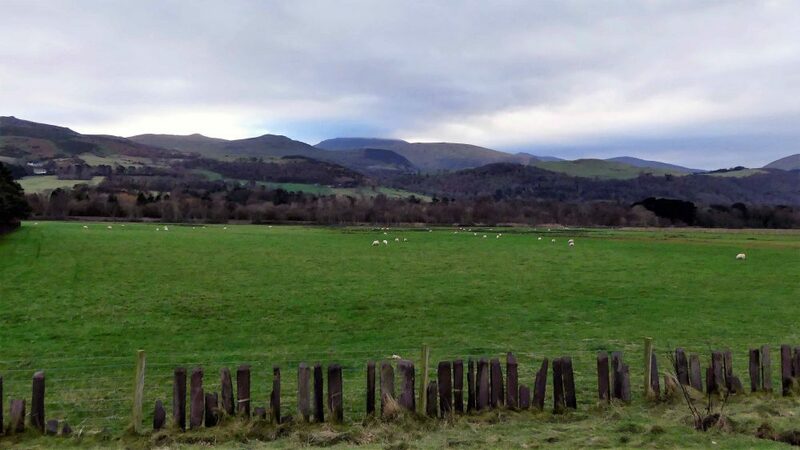 Slate pillar fences became common in north-west Wales from the middle of the 19th century. 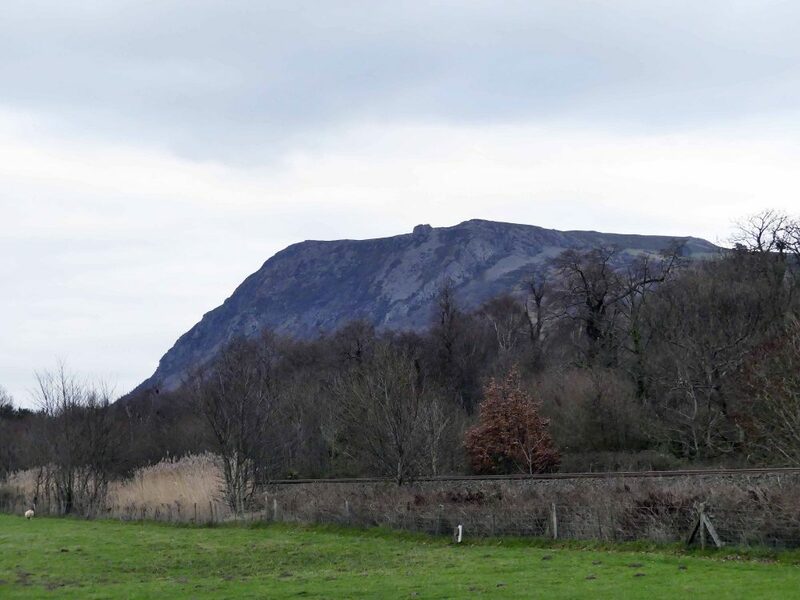 In 1861, the Penryhn Quarry at Bethesda, Gwynedd – one of the largest slate quarries in the world at that time – produced around 9,000 individual pillars. 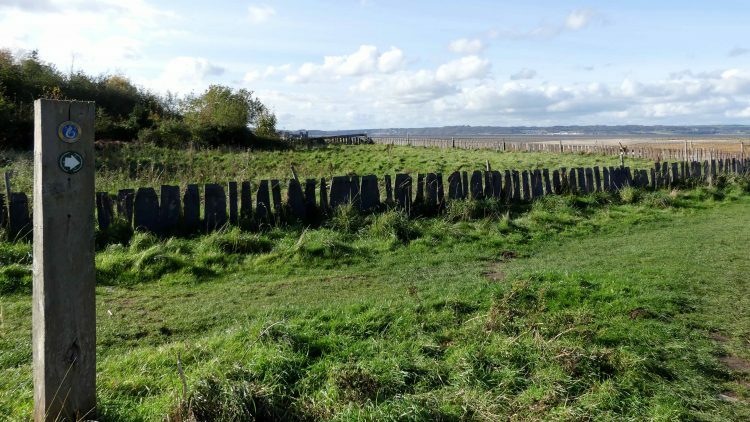 These pillars consisted of poor quality blue slate, typically about 150cm (4.9 feet) tall. 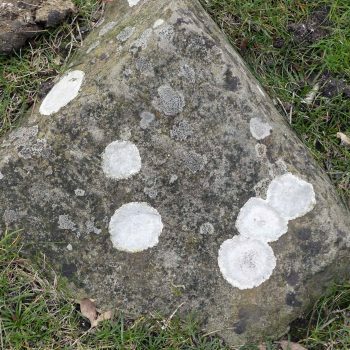 They were used to mark fields, gardens, railways lines and roads, with their simple construction being particularly well-suited to the harsh weather experienced by upland areas. It’s warmer in here and peaceful too if I zone out the constant sound of traffic racing along the nearby A55. Harder to ignore the raucous racket being made by of a couple of Crows though. 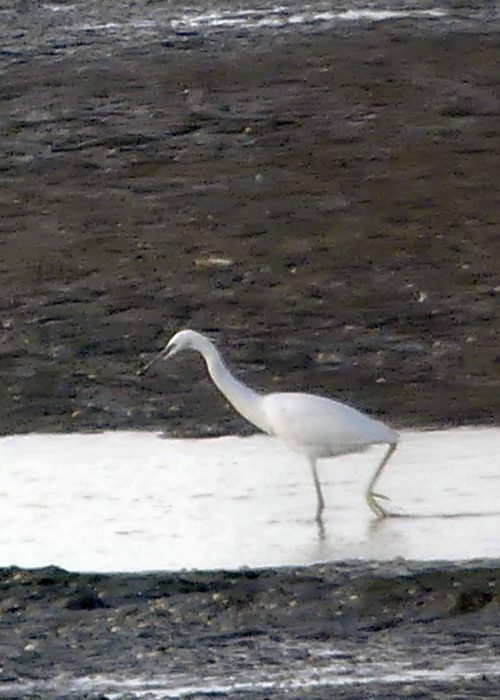 13:51- A Little Egret stalks back and forth in a shallow trench of a tidal pool. 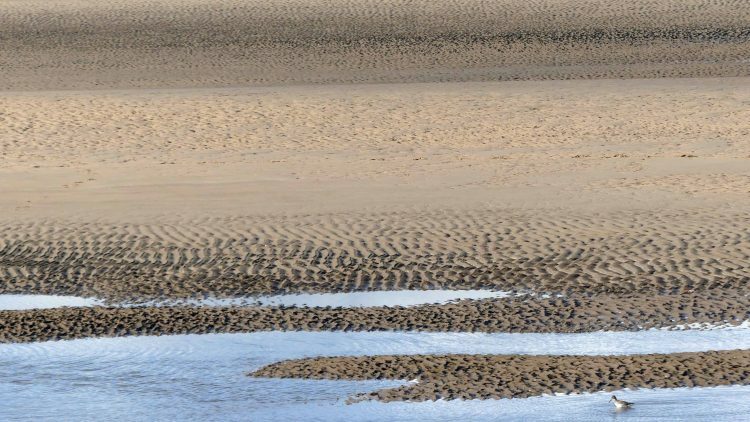 It takes a few slow graceful paces, pauses and delicately stirs up the muddy sand with one foot. 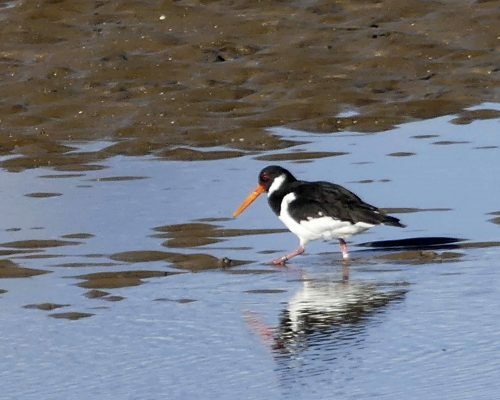 It leans forward peering intently into the water, then strikes down rapidly with its beak. I enjoyed that, it brought back warm and fuzzy memories of time spent watching them on the little Reserva close to where I lived in Spain. A helicopter flies very low overhead making a tremendous noise but the birds must be accustomed to it as none of them react at all. 13:56- I’m getting restless already and about to leave when I spot a swimming duck from the side window. 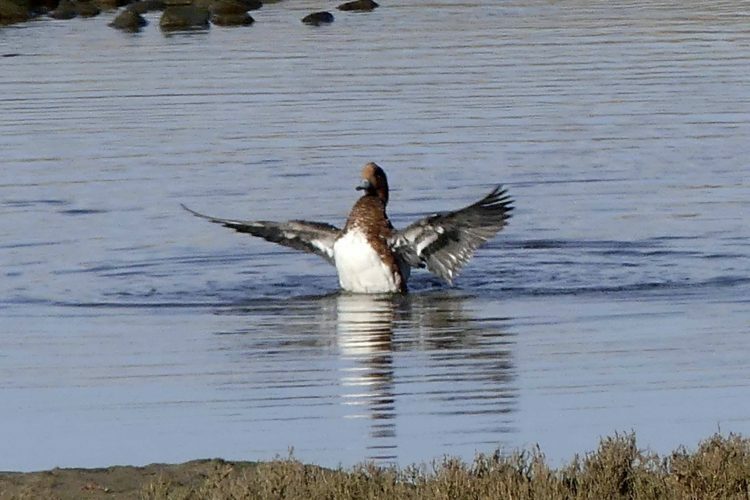 It’s a Wigeon drake and he seems to be thoroughly enjoying a vigorous bathe and preen of his feathers. 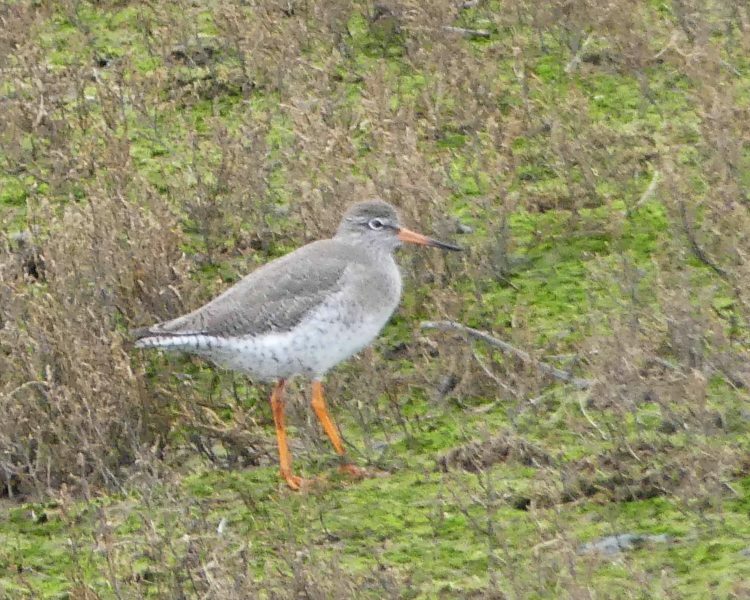 There’s a Redshank pecking around on the edge of the pool. 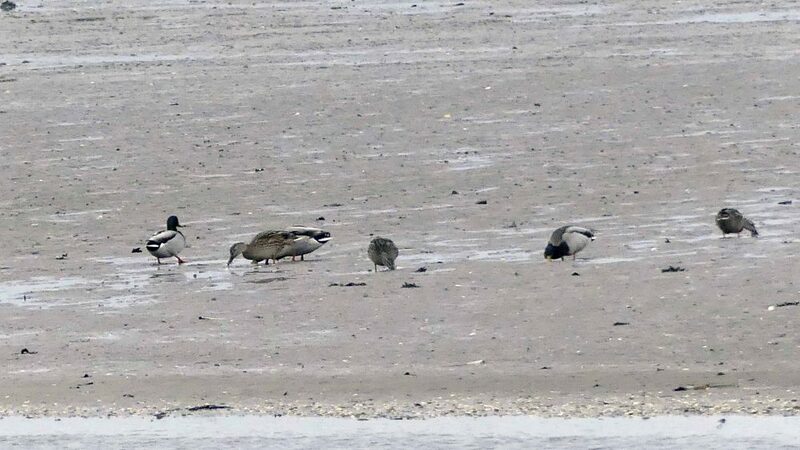 The chunky Wigeon makes the Redshank look tiny and dainty. 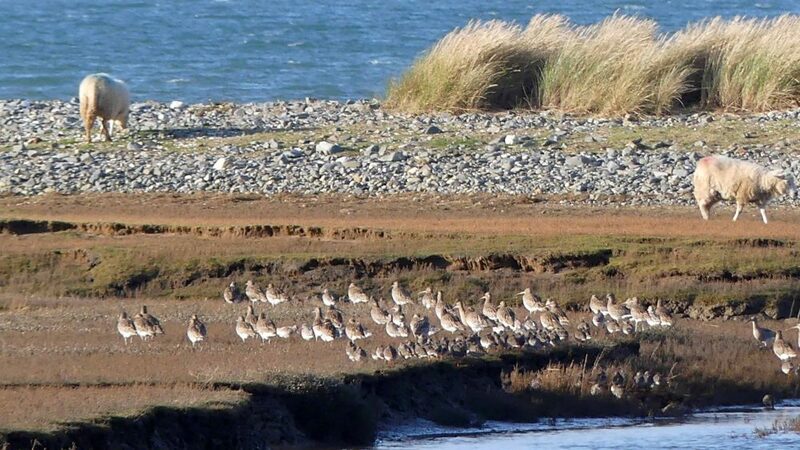 I sit for a bit longer and watch a small flock of Redshank fly in. 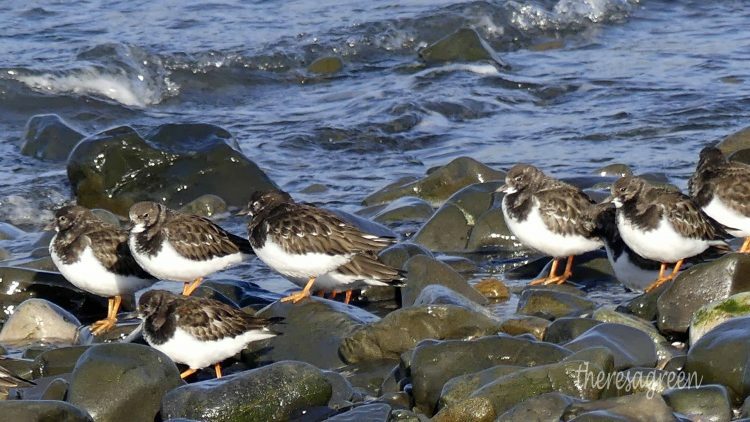 They are fidgety, taking off, flying around then returning almost immediately to the same spot several times before settling. Maybe they have to check out the health and safety aspects of the spot carefully as they seem to want a nap. 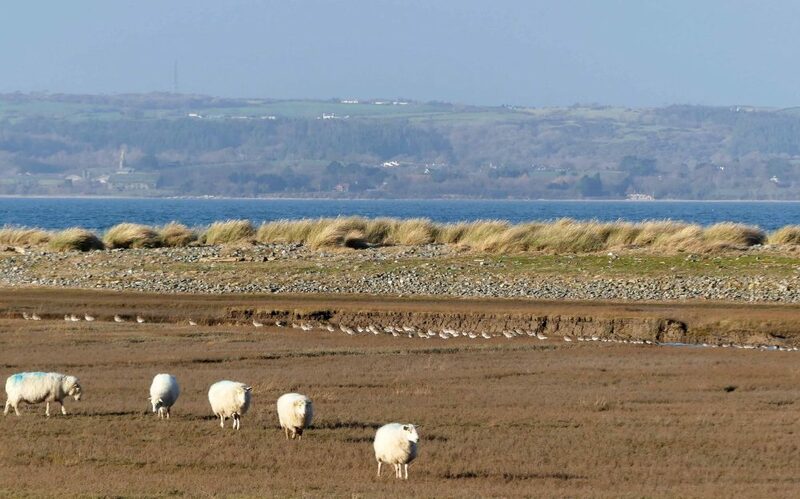 I take in the view across the Menai Strait to Puffin Island, in between there are so many shades and textures of shells, sand, mud, grass, rock and water the landscape looks almost other-planetary. 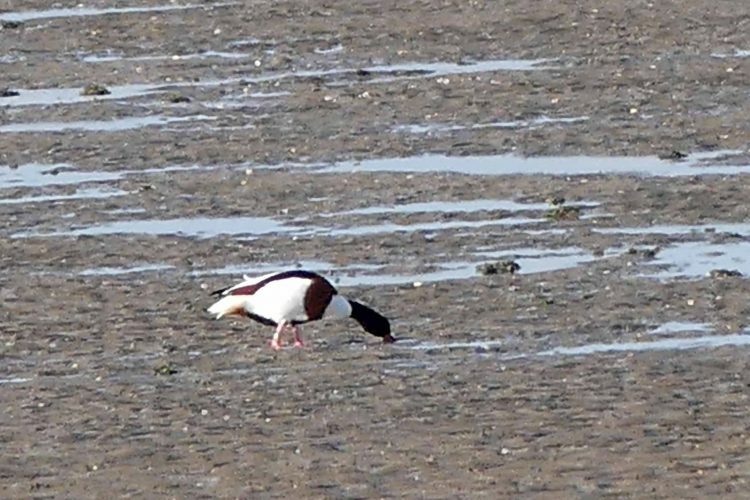 14:04- A pair of Shelduck come into view waddling across the sand. They have their heads down and look like they’re hoovering up what’s in front of them with their bills. 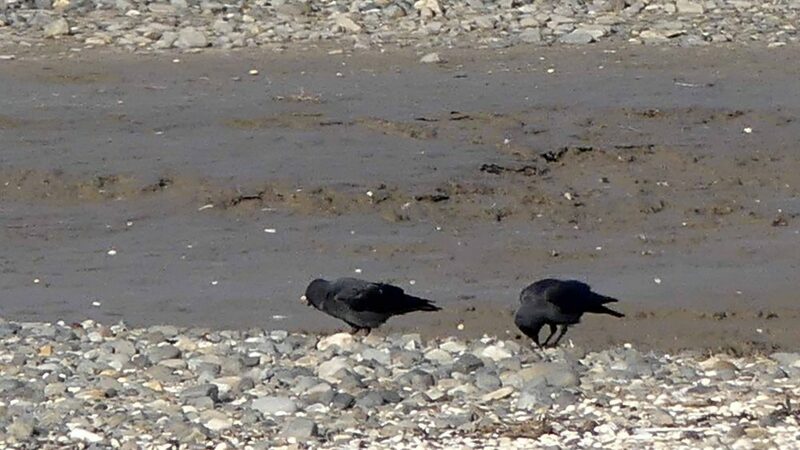 14:11 – The formerly noisy Crows come back for a quiet shellfish lunch. 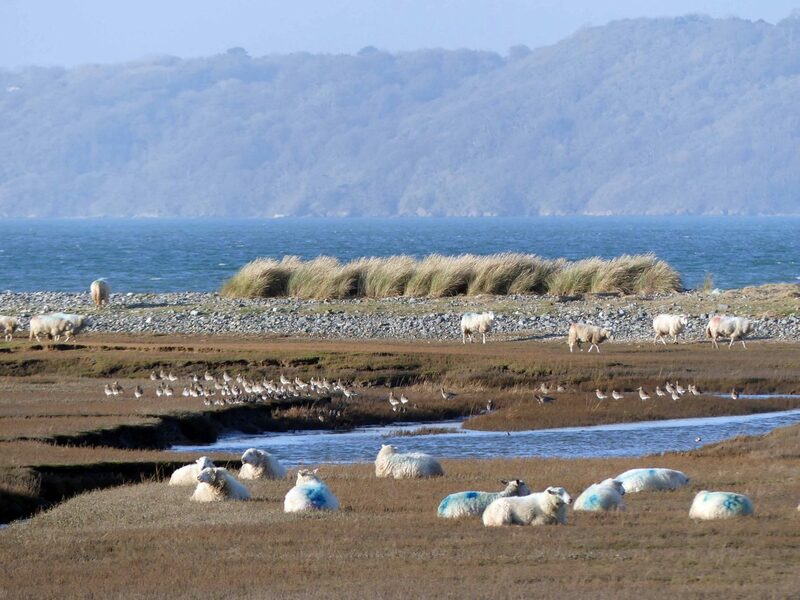 14:12- Sheep have wandered into view, heads down intent on grazing, which is exactly the job they are here to do; keeping down the grass and helping to clear scrub from bird nesting sites. 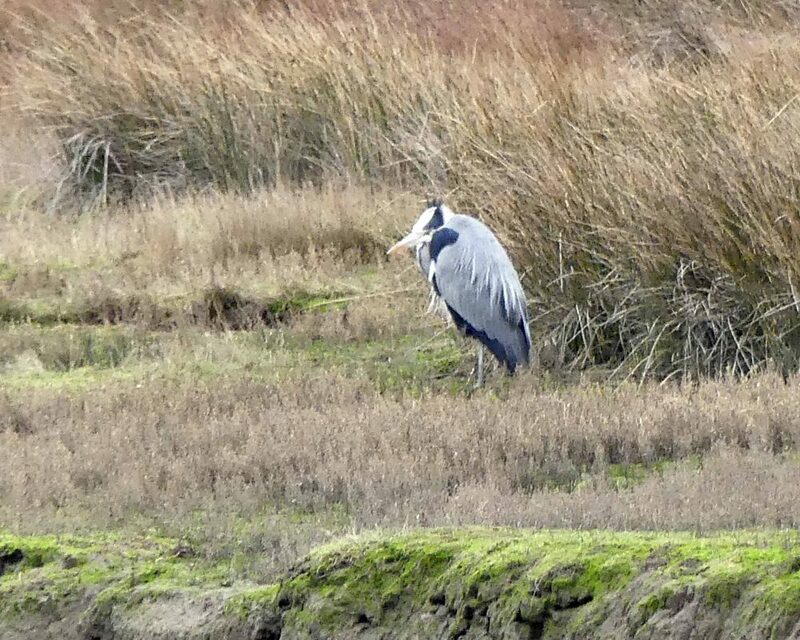 I stand up to leave, having a quick look through the rather dirty window on the other side of the hide before I do. There’s quite a large pool here but I can’t see it properly as it’s hidden behind reeds. I did see a dragonfly though. I’m surprised to see it this late in the year. I tried opening the window as it was too dirty to see through properly, but one of its hinges was broken, (see back to reason 6 of why I don’t like hides! ), I tried to close it back properly but it was too heavy; sorry, hope it’s still there. I take a snap of the manufacturers details on the door just in case, but I suspect the guarantee is up now…. 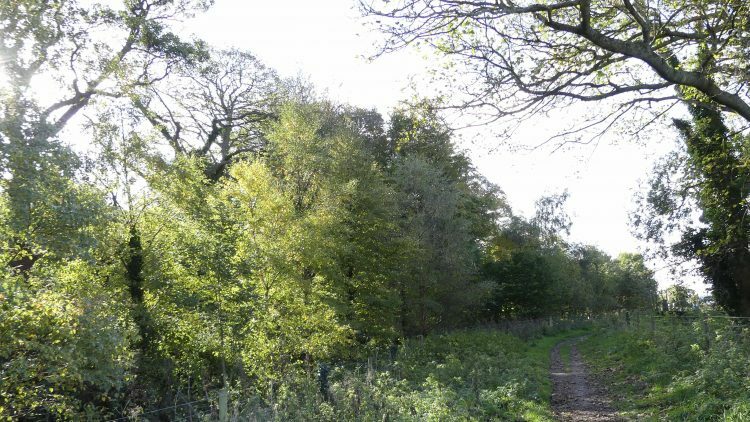 14:21 The Reserve is well vegetated and the height of the shrubbery either side of the paths is quite disorientating and feels a bit like a maze. I didn’t see even a single small bird in there today, but I’m sure there’s enough of a mix here to suit a variety of species. 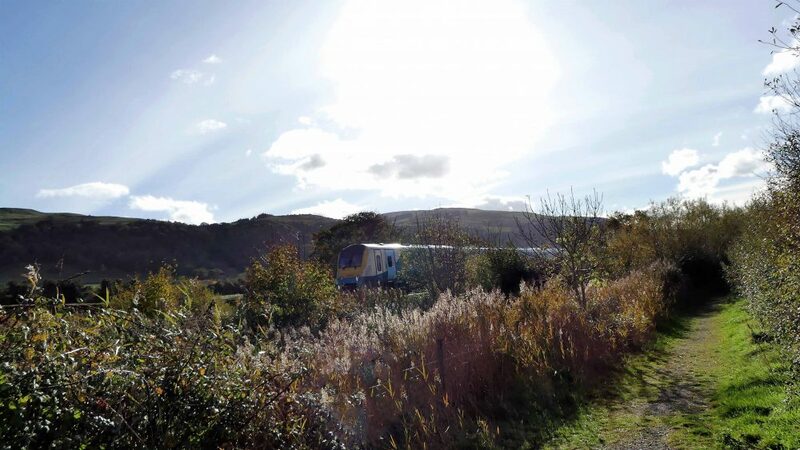 A train passing, this time coming from the Holyhead direction, makes me aware how close the train tracks are. The busy A55 is also only a small field’s width away too. 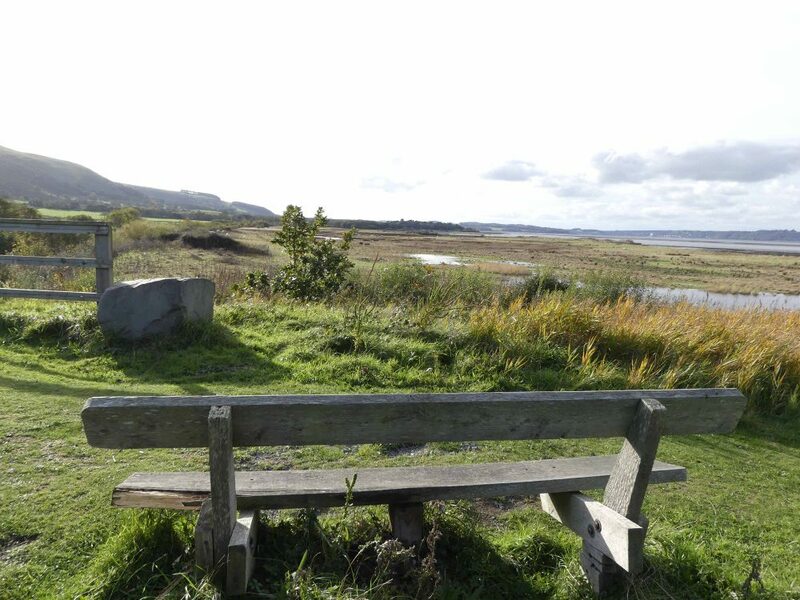 The far end of the Reserve is open and has a seat but I couldn’t quite work out why it was placed at the angle it is; it doesn’t directly face either the view overlooking the saltmarsh and Menai Strait or the mountains and there’s a young tree growing up in front of it too. I may have placed it to face this way….. Not that it mattered really as it was too cold for sitting around. 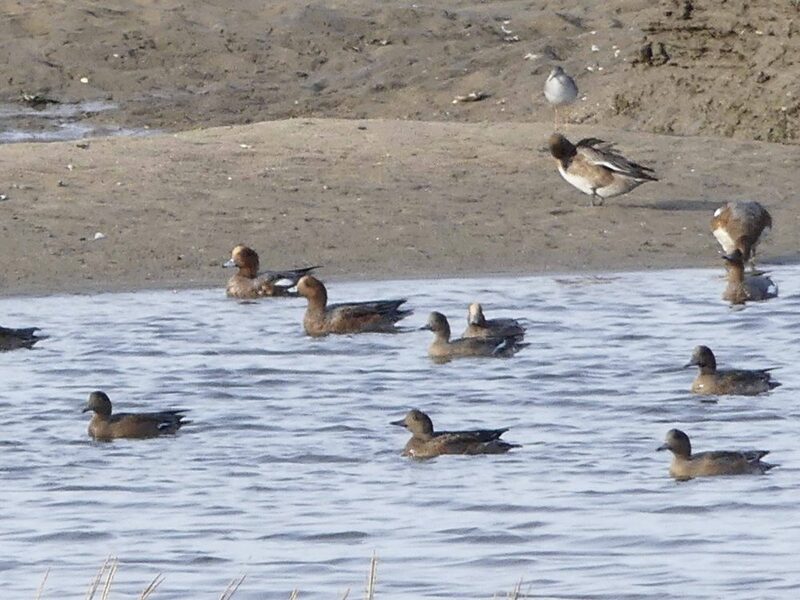 14:35- I’d left the reserve and came upon this lovely little party of Wigeon swimming about in a pool of water. You can see it was windy by the ripples on the water. 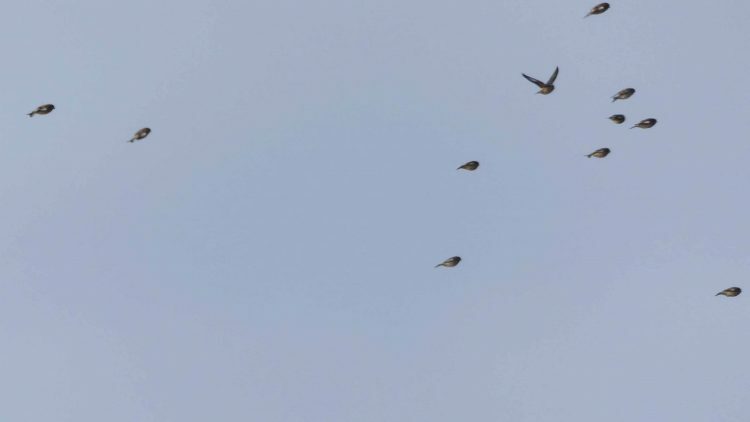 I noticed that the birds were all facing into the wind, I wonder if that made them more aerodynamic to stop them being buffeted about, or perhaps they had only just flown in and landed. 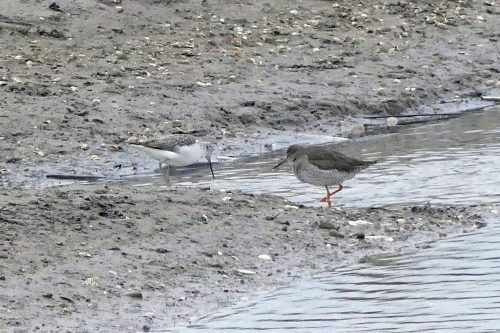 Another Redshank stood nearby watching them. 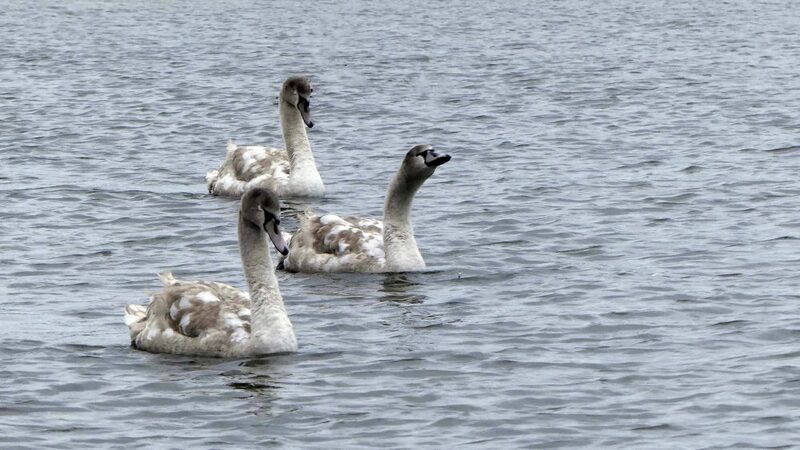 They soon broke out of their orderly arrangement on the water and began free swimming in all directions. 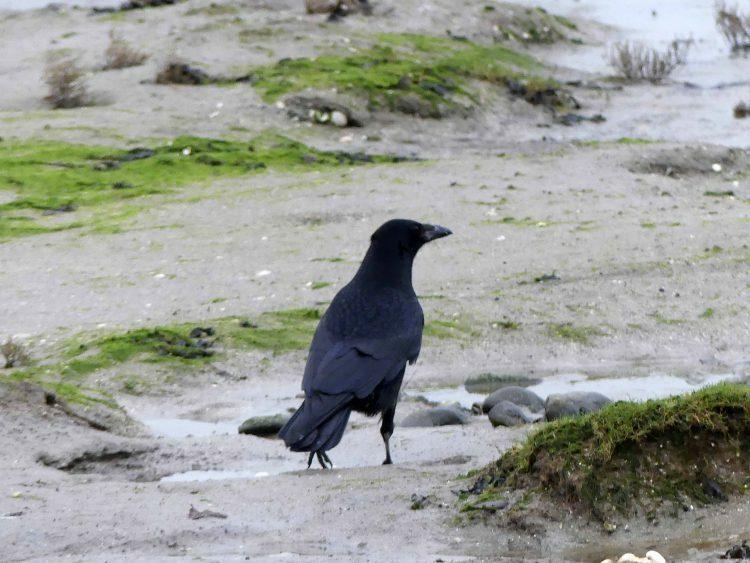 I noticed from the photograph that two of them are looking upwards; perhaps checking for aerial predators. This little group of three may (or may not!) be a family. 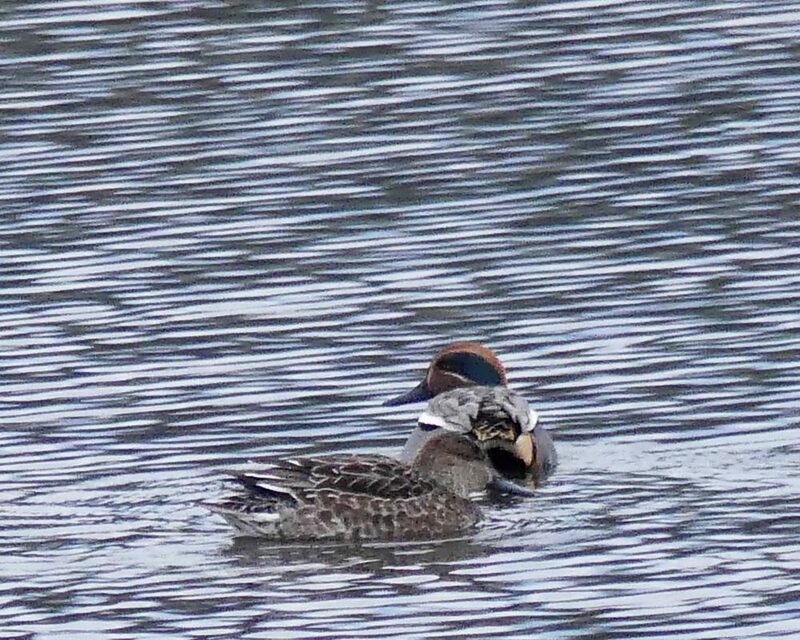 There’s an adult drake with his more patterned back plumage and chestnut head with the lighter stripe and a plainer chocolate brown duck, so I think the one with the white underbelly and brown upper parts must be a juvenile. I dither about what to do now, should I carry on along the Coast Path for a while or start heading back? 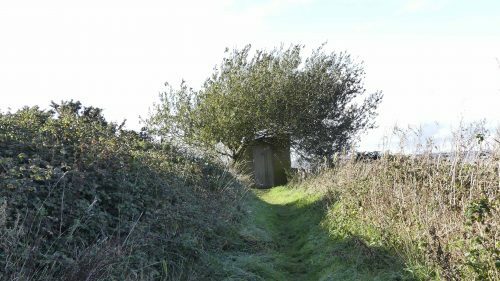 I opted to walk on a short way, then stopped, admired the view, saw how long and open the path going forward was, realised the light was already beginning to fade, that it was getting noticeably colder and turned round to walk back. 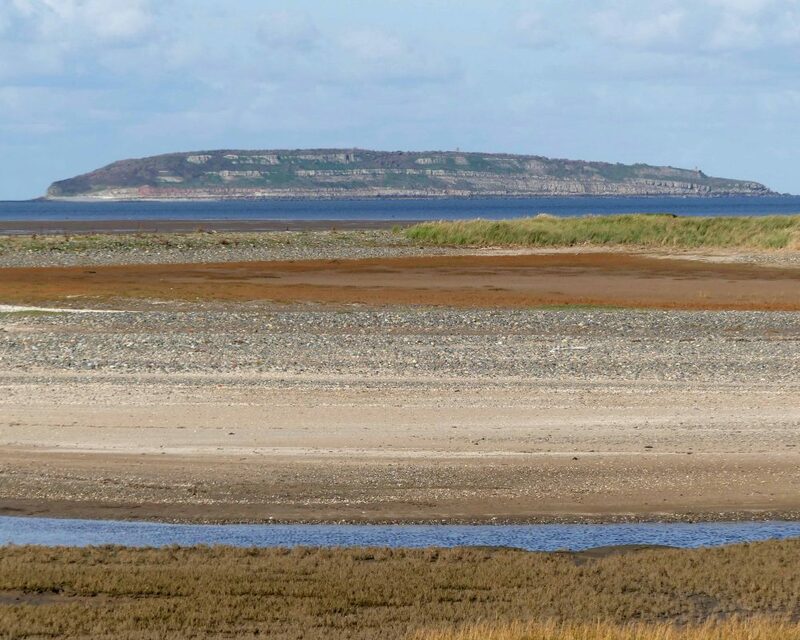 The beach area here in front of the reserve is the Spit, or Shell Island and it’s clear where it got its more attractive name from. 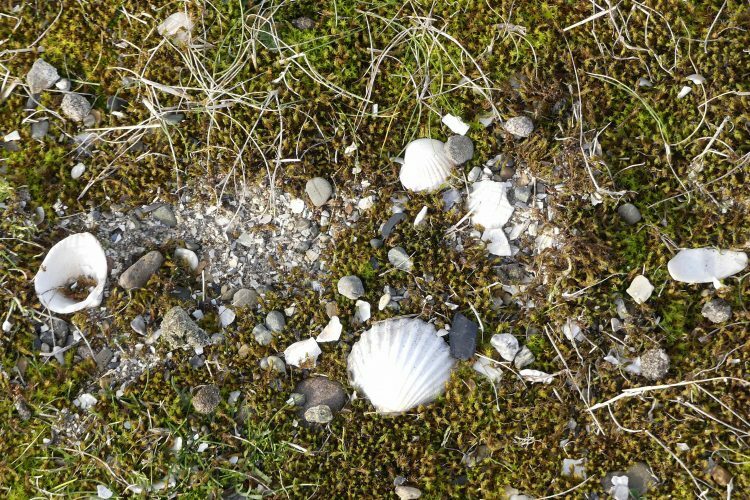 It literally is a stretch composed almost entirely of empty seashells. 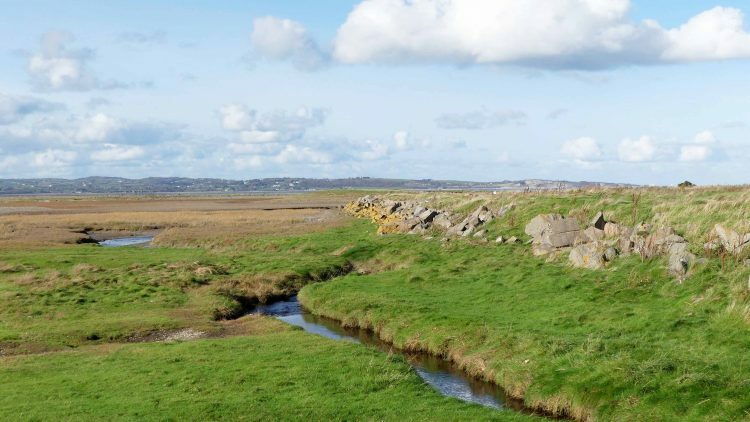 In my previous post, which covers the first part of this walk, you may recall the notice that requests that you stay off this area from March-September to avoid disturbing nesting birds and also at high tide from October-February so as not to disturb roosting birds. 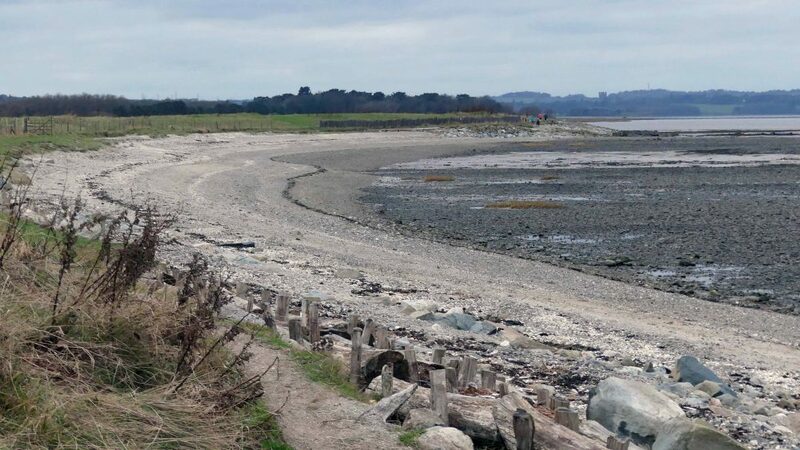 A further notice here advises that Ringed Plovers nest on the shell ridge till the end of August, so please stick to the Coast path that follows the line of the fence, and once again keep dogs under control. 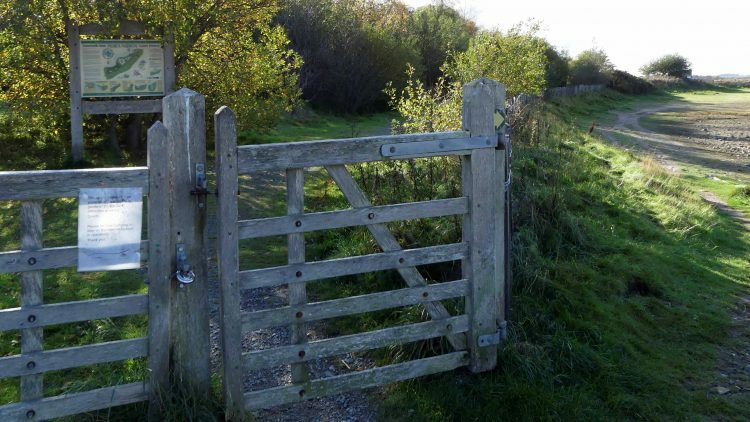 This is one of many instances along the Coast Path route where there is a conflict of interest between people and nature. 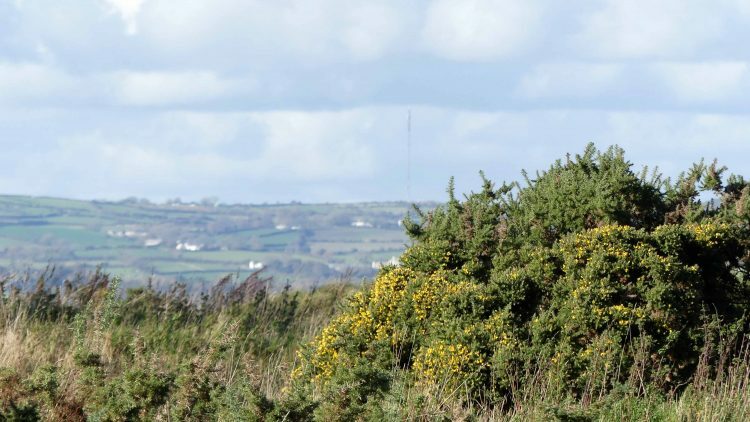 Of course walkers want to be as close as possible to the coast, but unfortunately don’t always respect that this is first and foremost a wild habitat that they have the privilege of passing through. There’s a mix of shells here, cockles, mussels and clams to name a few. Most are broken or crushed, but some remain intact. Beyond the high tide line at the back of the beach there are small plants, mostly moss, which is often one of the first plants to establish on rocky land: they can break down rock and soil to create a more hospitable environment for other plants and absorb moisture so act as sponges, soaking up rainfall and helping prevent erosion of the landscapes. I noticed a lot of rabbit pellets scattered around too, adding fertiliser and fibre. 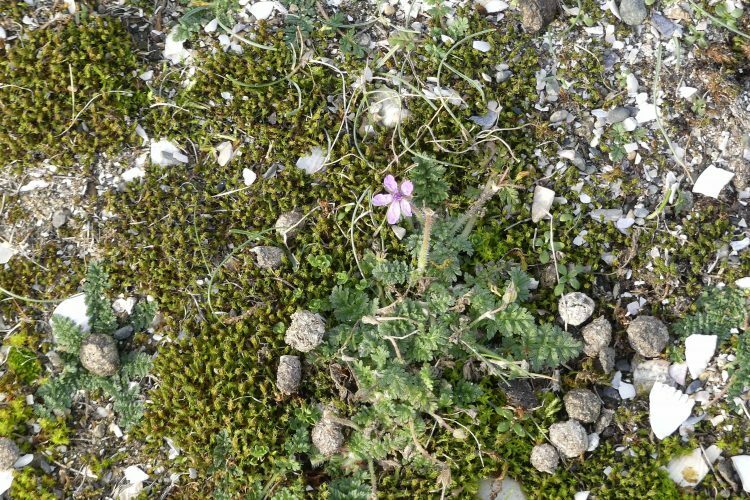 I was pleased to spot this tiny storksbill plant in flower. I’m not certain of the species but I’m hoping it was Sticky Storksbill-Erodium lebelli. (Storksbills are notoriously tricky to identify with certainty). 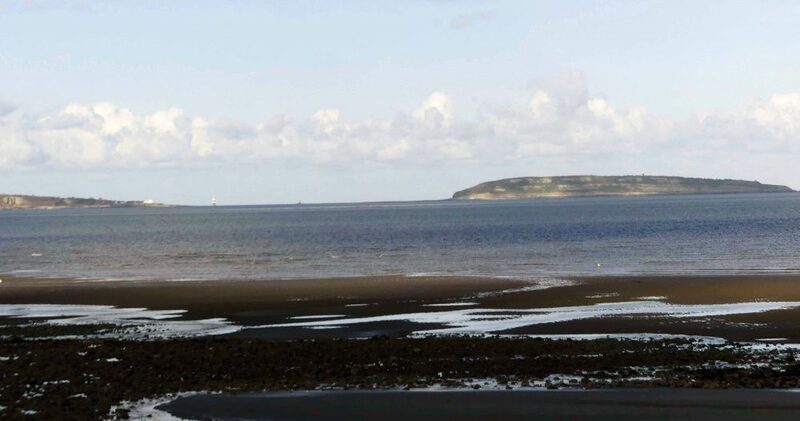 A last view from here over Traeth Lafan sands to Puffin Island and Anglesey and I set off to walk back. 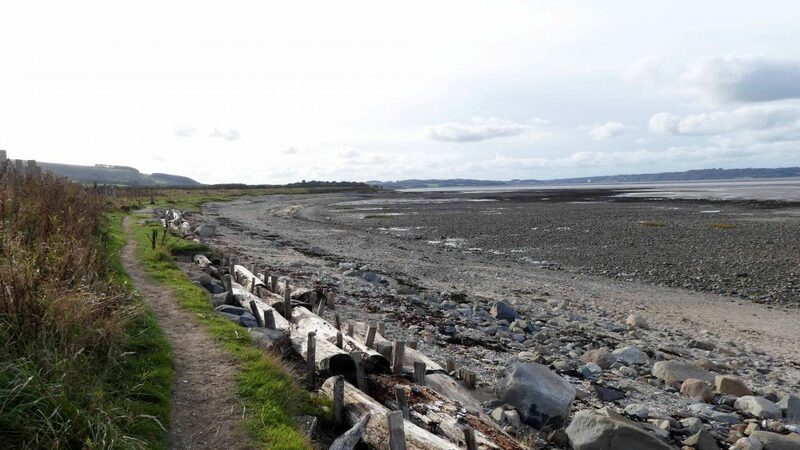 Located about halfway between Conwy and Bangor, Llanfairfechan is linked to the other small seaside towns of the North Wales coast popularised by adventurous Victorians by the main Chester to Holyhead railway line and more latterly the A55 North Wales Expressway. 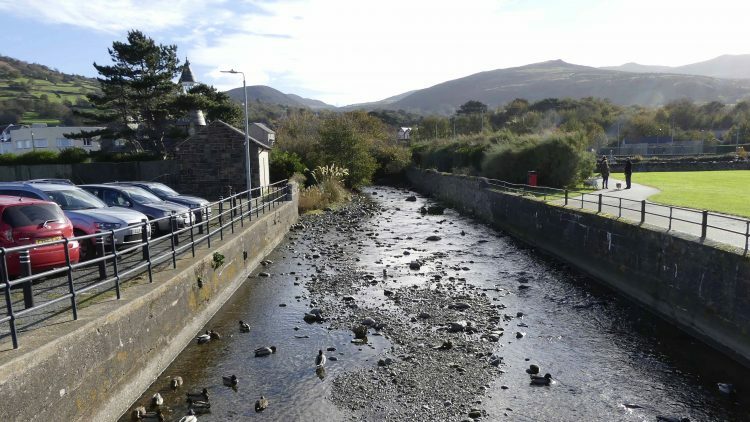 The town grew on a narrow strip of coastal land backed by the steep hillsides and mountains of the Carneddau range. Its continuing wide appeal is easy to see. 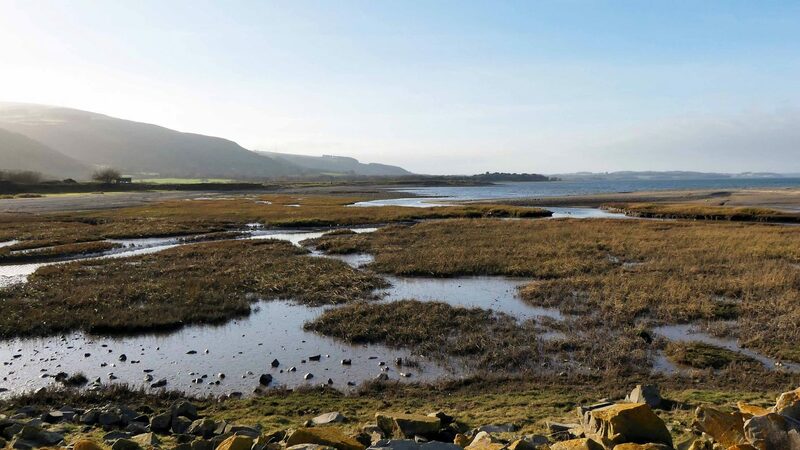 The scenery and views are spectacular and there is an array of well-established wonderfully diverse walks along the coast, through woodland, along the river and in the mountains behind it. 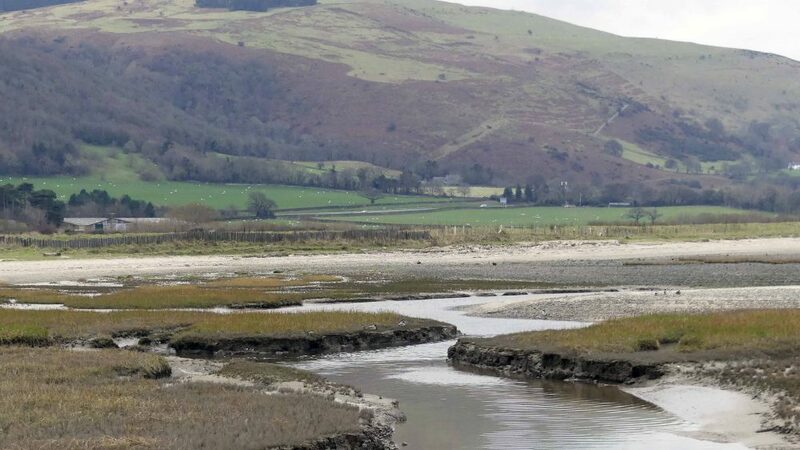 Once mostly privately owned, much of the landscape is now the responsibility of Conwy Borough Council and managed as a series of Local Nature Reserves and I was heading for one of them, Morfa Madryn, which sounds and often looks like it belongs in a Tolkein novel, but is the salt marsh area that lies to the west of the town. 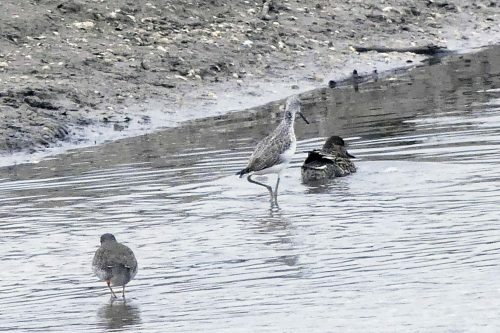 I’m trying to improve my recognition and knowledge of ducks, so I was particularly hoping to see some of the ducks and waders that are permanently resident or that overwinter here. The route I took on a gloriously sunny November day began and ended in the seafront car park at the beginning of the Promenade. As always I found a great deal of interesting stuff to see along the way and on the way back; too much for a single post, hence this being Part 1. 12:12 The tide was out, it was cold, a bit windy but brightly sunny with a bit of a haze on the horizon. Being a Saturday, the (free) car park was already busy. 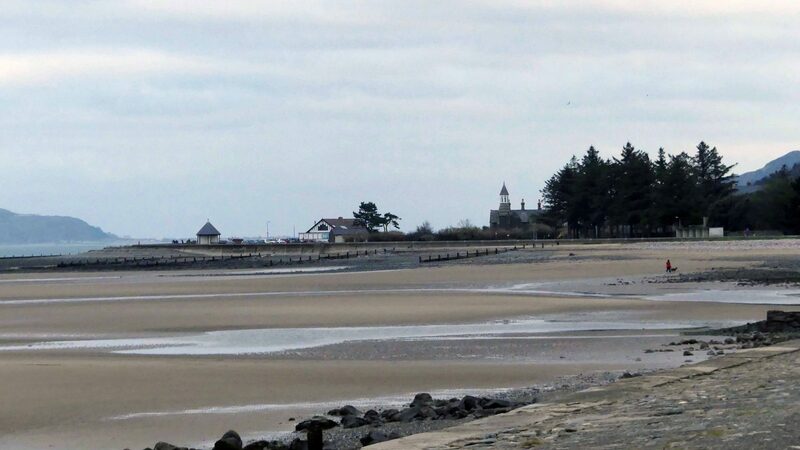 The café was filling up but a good few people were out walking along the Promenade, or the Cob as it is known locally and there were others on the beach. 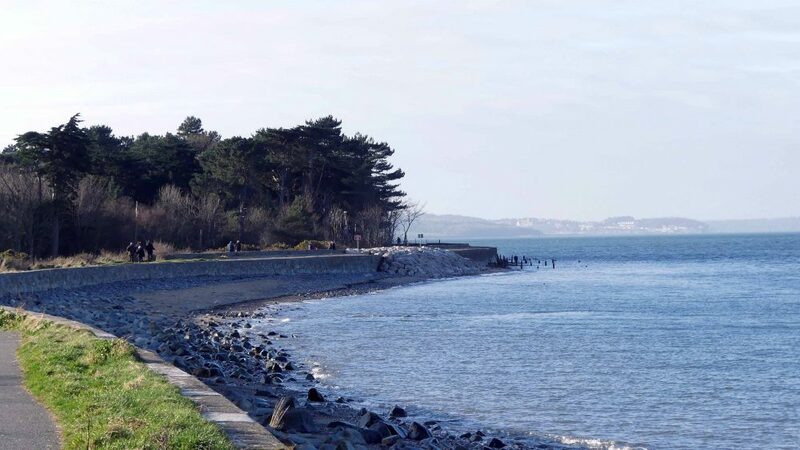 It’s a popular spot with dog walkers. 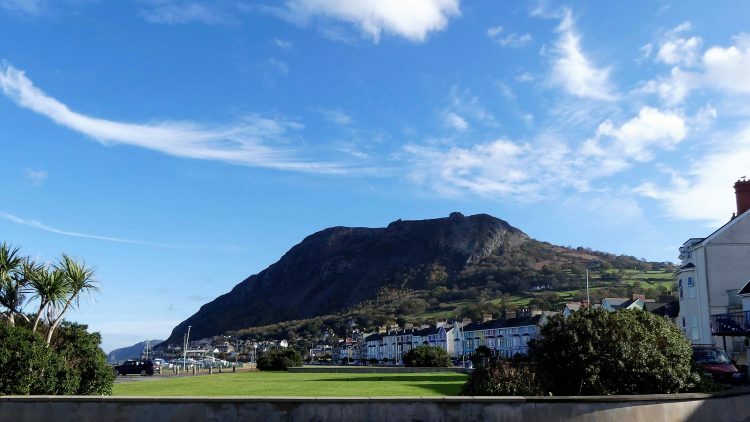 The great bulk of Penmaenmawr Mountain fills the view to the east, but then from the Promenade the sea views are wide and spectacular. 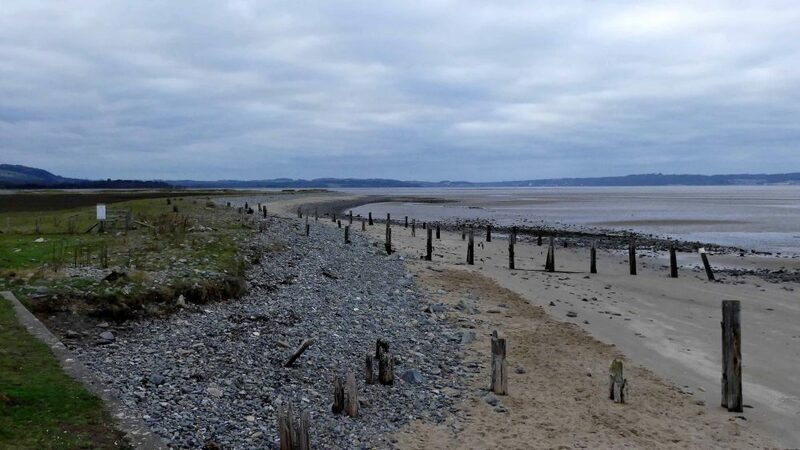 Vast expanses of the sands of Traeth Lafan are exposed and the bulks of rocky headlands are dwarfed under endless skies. 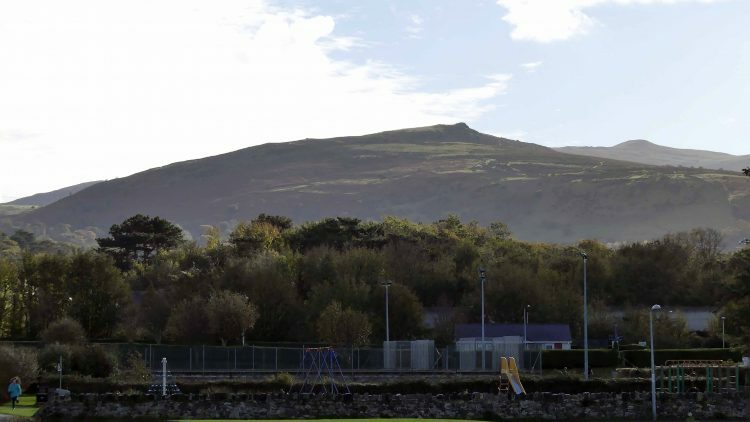 The Great Orme could almost be mistaken for an island, but today you can see the tenuous connection, upon which Llandudno is built, that tethers it to the mainland. A bit further along are Puffin Island and the distinctive lighthouse painted with black and white rings that stands in the sound between the island and Penmon Point on the tip of Anglesey. 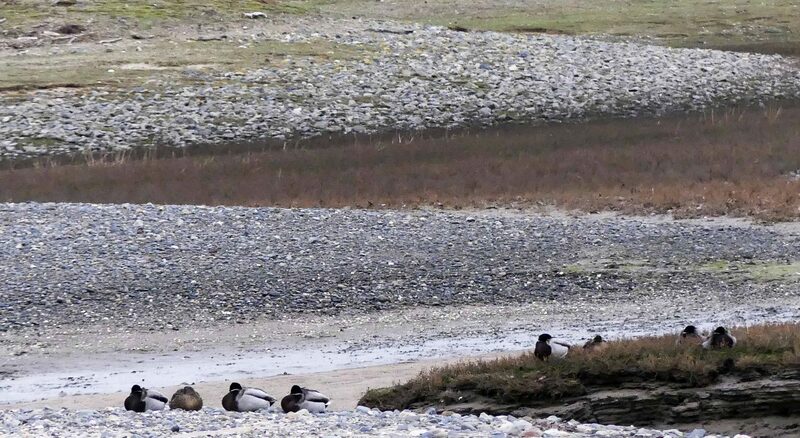 I followed the Promenade and crossed the bridge over the river, the Afon Llanfairfechan, the water was shallow but fast-flowing and the resident flock of Mallard was hanging around hopeful of some easy lunch. Dippers are often to be seen further upstream, so it’s always worth a look for one here, although I’ve yet to see one this far down. The bridge leads into the landscaped recreational area with lawns, tennis courts, bowling green, children’s playground and a large lake. 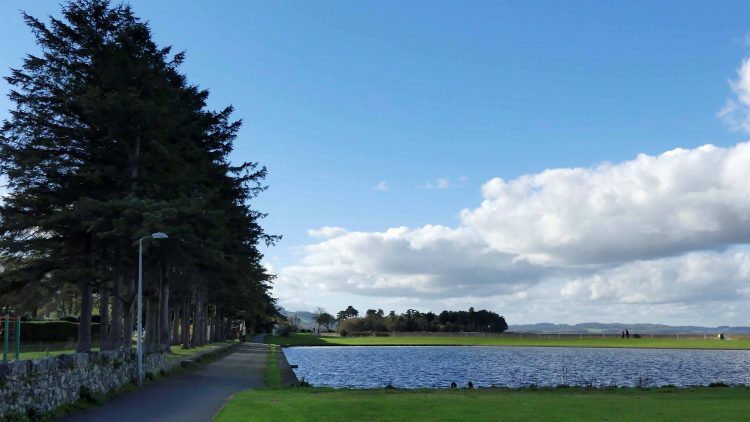 Originally built as a Model Yacht Pond it is still used today by enthusiasts of engine-powered model boats. In the shelter of the pavilion sun-faded information boards show the ducks and waders most likely to be spotted here. Ducks include Shelduck, Gt Crested Grebe, Widgeon, Goldeneye, Teal, Red-breasted Merganser, and of course Mallard. 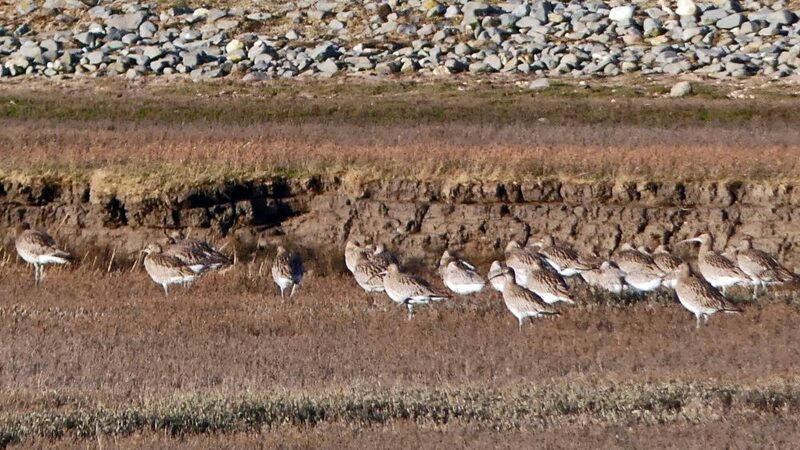 Waders pictured are Curlew, Bar-tailed Godwit, Black-tailed Godwit, Redshank, Greenshank, Oystercatcher, Ringed Plover, Grey Plover, Lapwing, Dunlin, Turnstone and Knot. I guess the spikes on top of the boards are to deter less desirable birds from roosting in the shelter. I headed away from the Promenade towards the children’s playground to follow the path along the far side of the Boating Lake. 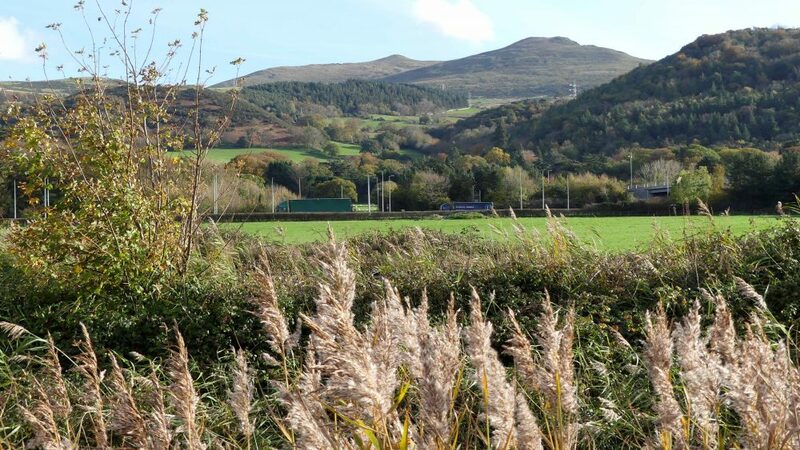 The mountain in the background with its distinctive peak is Garreg Fawr. 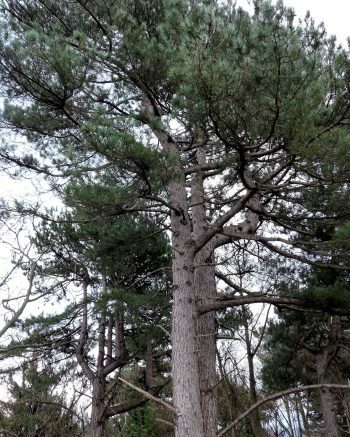 An orderly line of well-groomed pine trees stands to attention along the edge of the path. 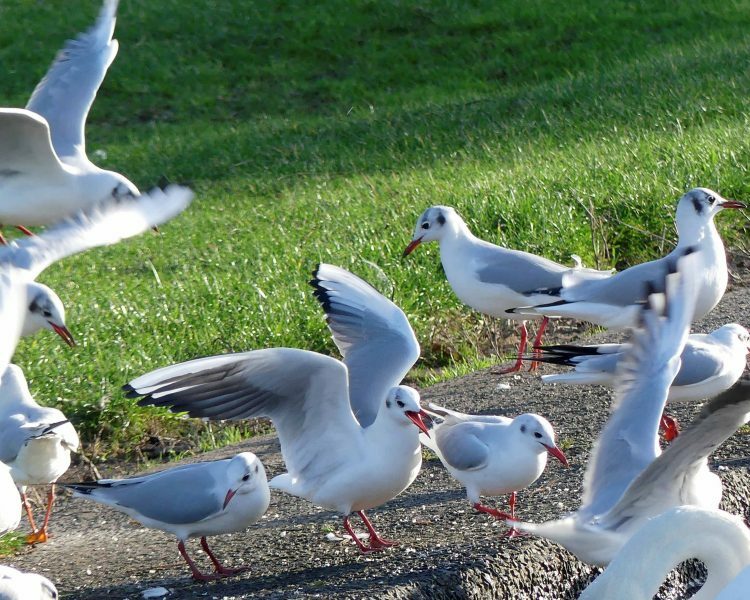 On the grassy lawns around the lake Black-headed Gulls rest or seek prey in the grass. 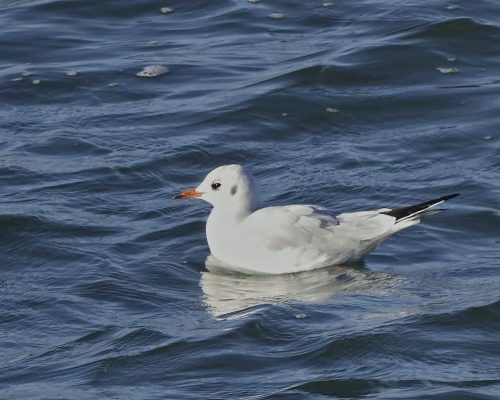 Their heads showed varying stages of plumage; most now have lost their dark heads and sport the winter-white head with the black spot to the side of each eye. 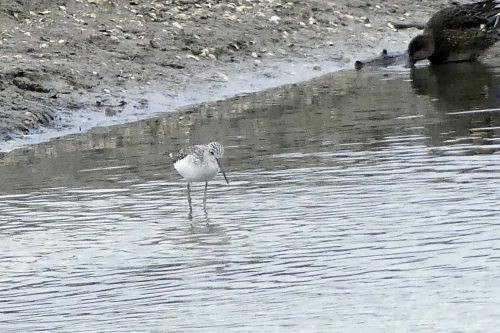 One was darker around the eyes; I’m not sure if it’s late changing from breeding to winter plumage or already beginning to gain back its breeding plumage. 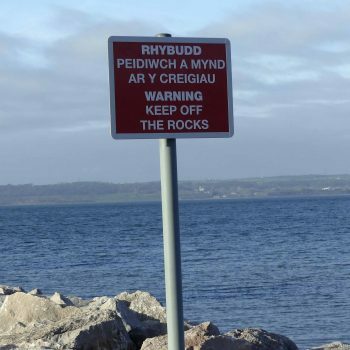 The Promenade here is a safe and popular spot for outings with families and with dog walkers, so there are many signs advising what not to do. 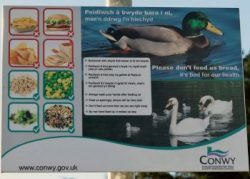 Lakeside, one such reminds folk to resist the temptation to feed the ducks and swans with bread and chips! I’m not sure how much notice is taken of that one. 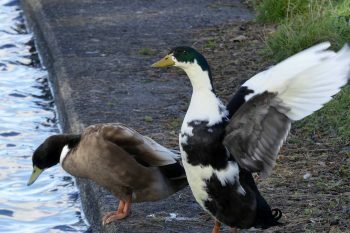 Most of the resident ducks are recognisably Mallards, but a few clearly have both Mallard and domestic ducks as ancestors, inheriting characteristics from both as have this pair I passed on the edge of the lake. 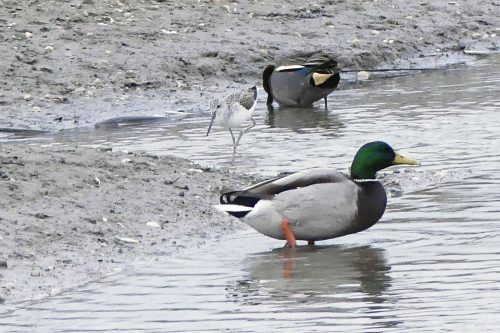 Typically a blend of Mallard, Rouen and Runner ducks, these are Khaki Campbells Anas platyrhynchos domesticus and are often kept commercially for their generous egg production. They come in variations on three basic colours, khaki, dark and white. 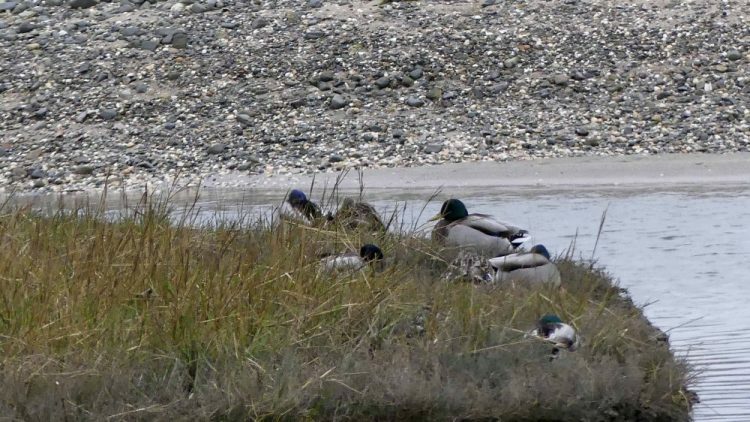 A Khaki Campbell drake is mostly khaki coloured with a darker head, usually olive green and without the white ring (male) of its Mallard ancestors; the duck (female) typically has a more modest plumage of khaki covering her entire body. 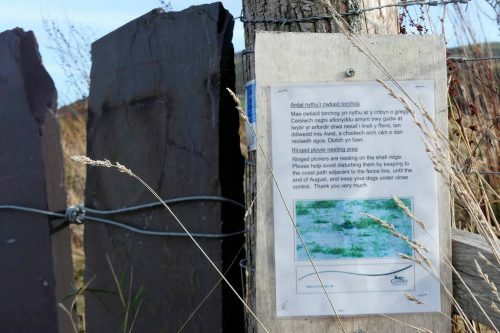 One notice on the wall, placed there in 1908 is well worth stopping to read; a reminder that this wild and free land was once privately owned and public access granted under sufferance and a strict code of conduct! 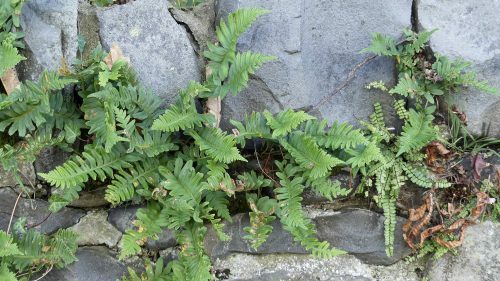 Small ferns push out their fronds from crevices in the stone wall that bounds the woodland. Mostly Common Polypody, there are also a few smaller, finer plants of Maidenhair Spleenwort. Both species have seed spores, sori, on the backs of their fronds. 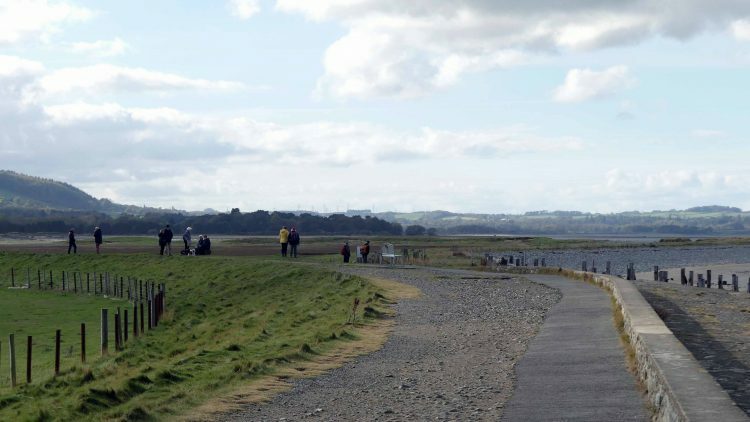 The pathway soon rejoins the Promenade and continues past a few houses and fields on the landward side. 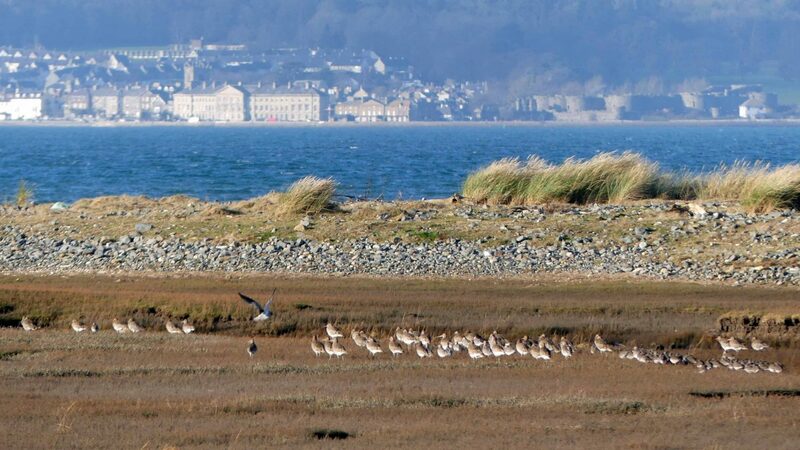 Residents here have enviable views over the sands and the Menai Strait to the coast of Anglesey, but it gets wild here in the winter. 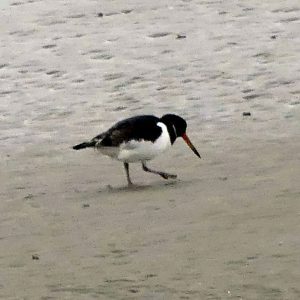 I stopped to watch an Oystercatcher in a pool of water. 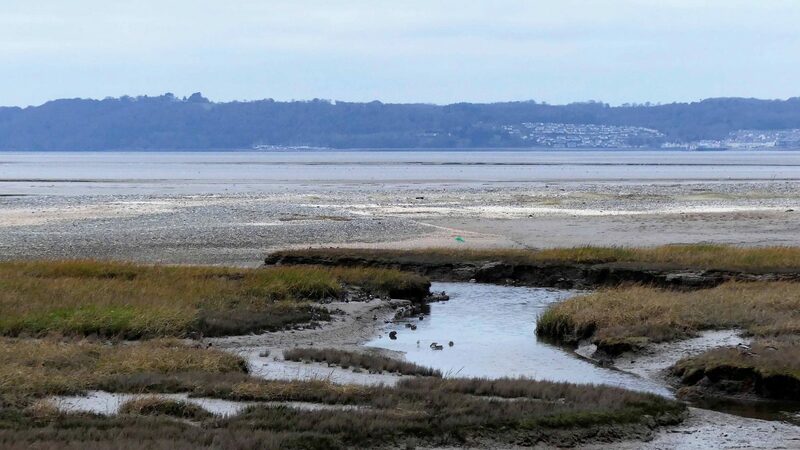 The mud and sands hold a bountiful supply of cockles, mussels, lugworms and small fish which draws in large numbers of wading birds. 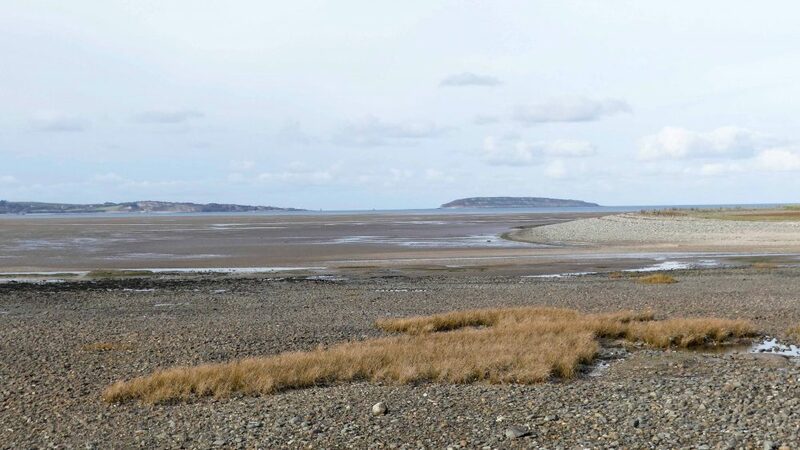 Needless to say the food supply also attracts humans and the gathering of shellfish together with water pollution is impacting on the fragile ecology of the area. The exposed sand is left patterned and textured by the movement of water rippling over it creating fascinating artistic effects. 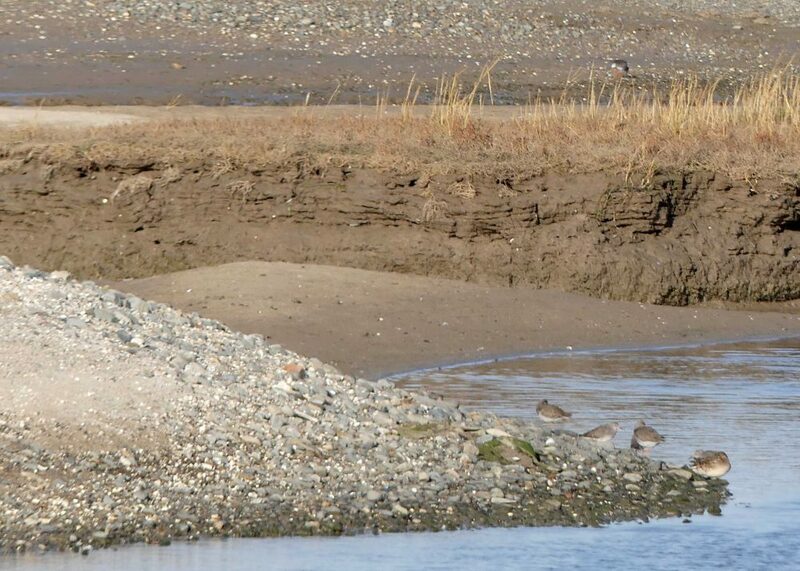 Changes in level results in tidal pools of varying depths being left; good hunting places for the birds. 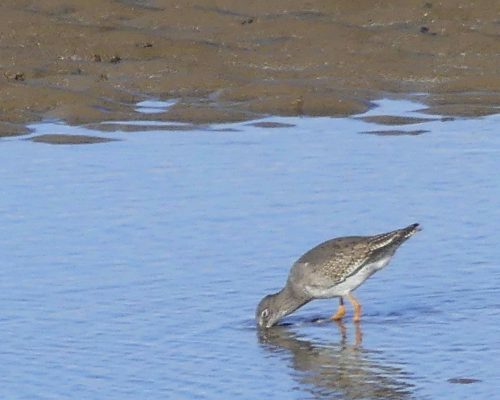 In the bright sunlight it took a while to ‘get my eye in’ and spot wading birds, especially when they were as distant and well camouflaged as this Redshank was. Camera at full zoom I watched as it stalked knee-deep in water, scanning intently for prey, then stopped to plunge the entire length of its long bill below the surface. 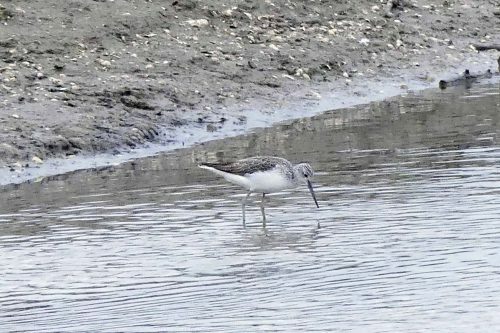 Another stalked the sands, better showing its diagnostic red legs. Stopping it too probed deep into the sand and pulled out something, maybe a smallish flat fish which it carried away clamped in its bill. 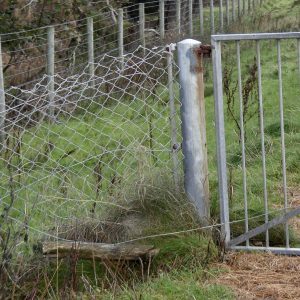 12:46 A metal fence/gate with more notices pertaining to dogs, fines and disturbance safeguards the entrance to Glan y Môr Elias Reserve. I love the log tied on with rope that acts as a counter-weight to keep the gate closed. Simple but effective. 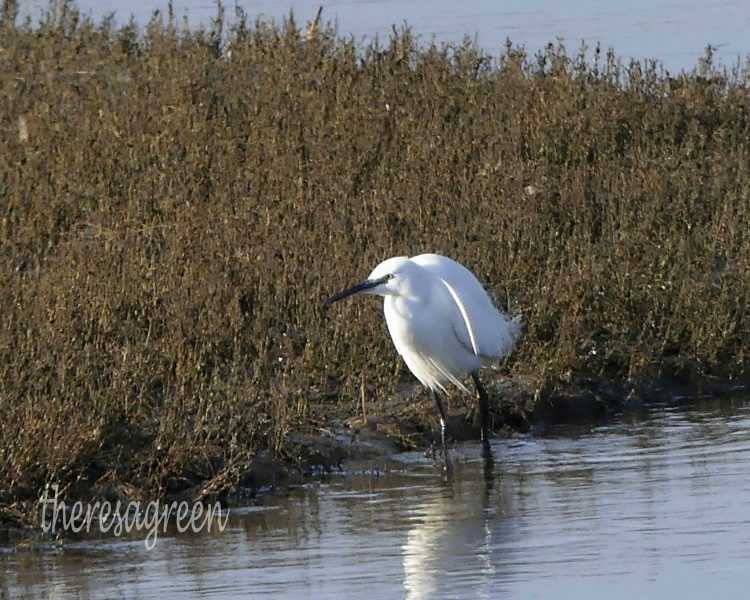 A short way into the reserve a movement on the sands below gave me my first view of the day of a Little Egret. 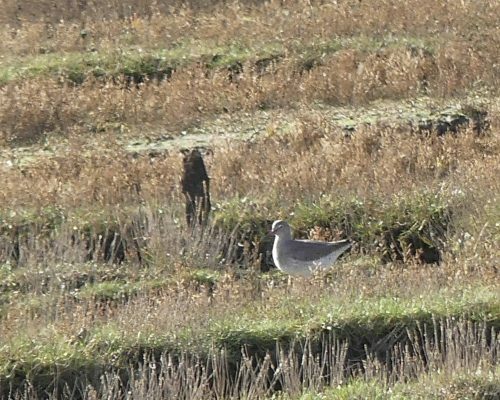 A lucky spot as its bright white plumage rendered it barely visible in the bright sunlight. 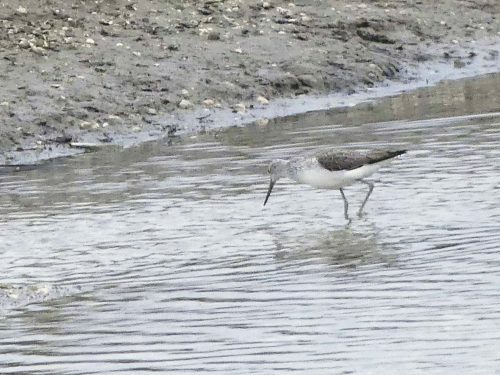 It elegantly and stealthily stalked prey in a shallow stream of water, its lethal dagger-like bill poised then struck at speed. 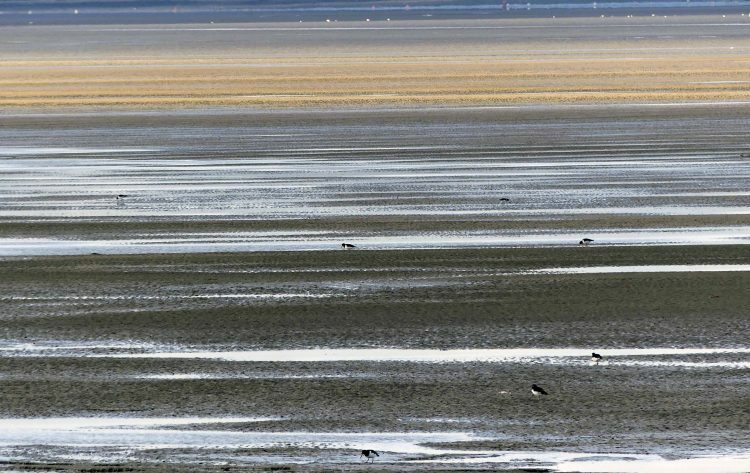 Further out again, the wet muddy sands were punctuated with hunting Oystercatchers, which interestingly were all travelling along in the same direction. 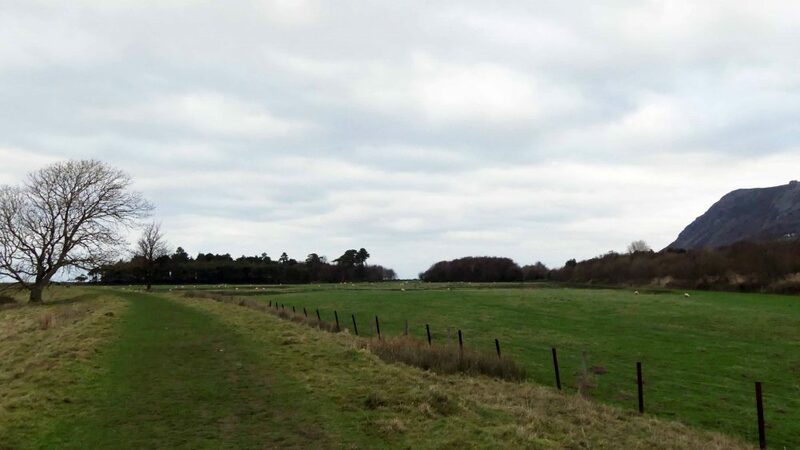 12:56 The main Chester to Holyhead train track defines the boundary of the reserve. Trains pass by frequently, this one an Arriva operated train (now Transport for Wales). 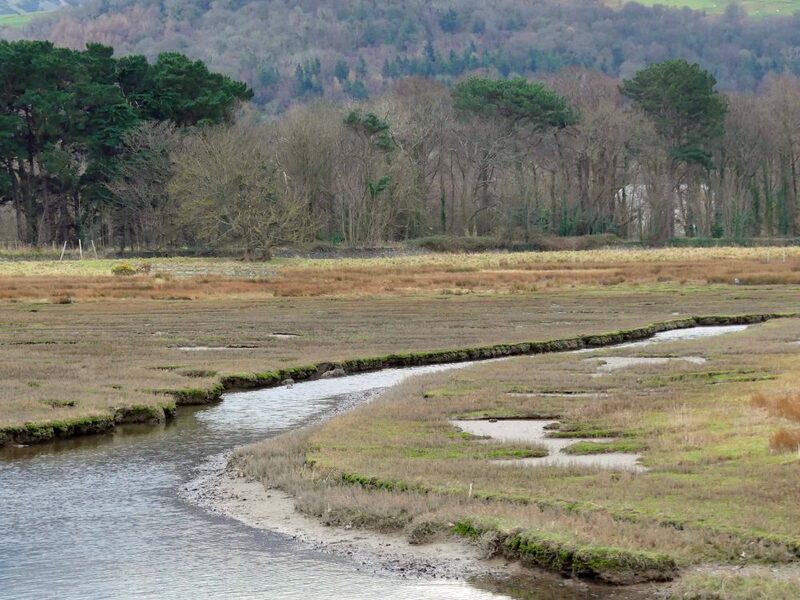 The Promenade peters out here where the expanse of salt marsh begins and stretches forwards along the Menai Strait. 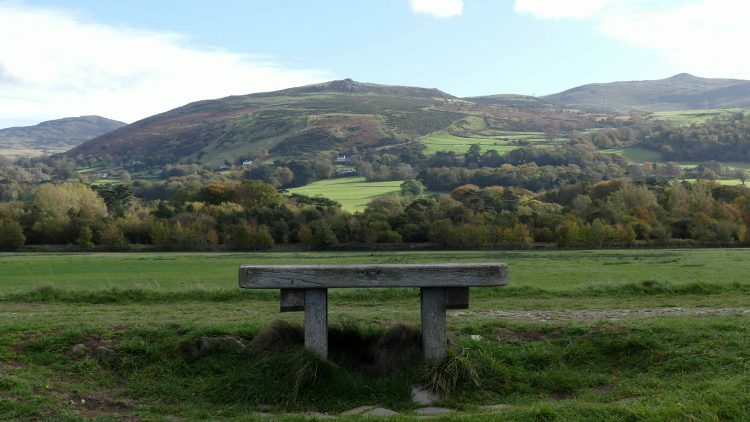 A wooden bench located here offers two widely-differing panoramic vistas. 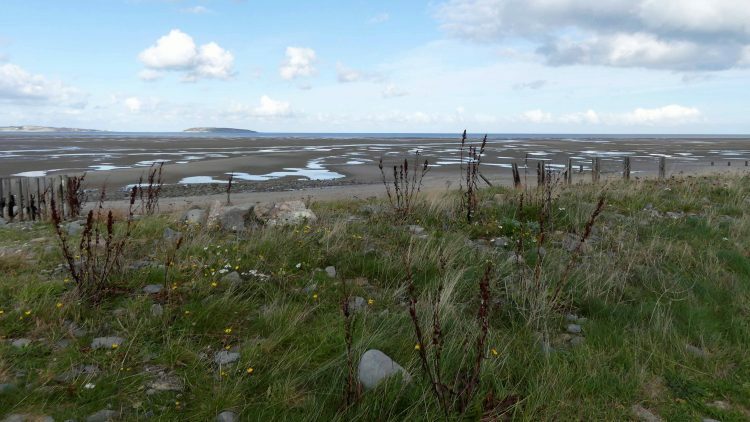 You can sit and gaze both at the mountains and out across the exposed windswept mudflats where Puffin Island and the tip of Anglesey are visible on the horizon. I was surprised to find Sea Daisies still flowering here. Despite the sunshine the wind was keeping the air temperature down, not a day for lingering on benches, best to admire the views while in motion. 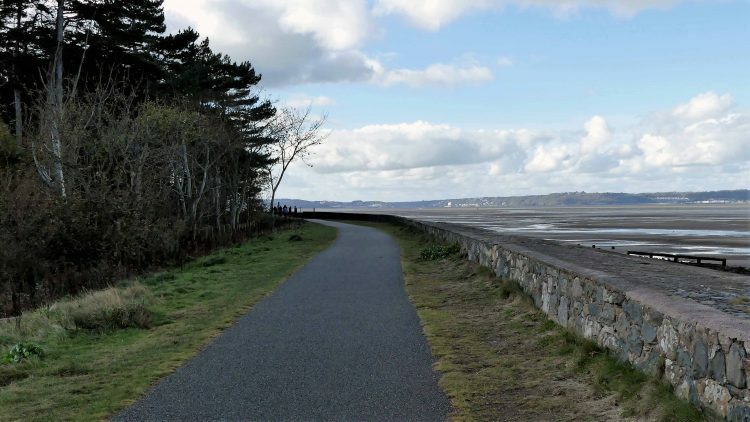 13:02 The Wales Coast Path includes the section of the Promenade I’d followed to here and it continues on to follow the line of the seashore as a grass trail along a raised embankment. Before carrying on I obeyed another sign in front of a gate to STOP. 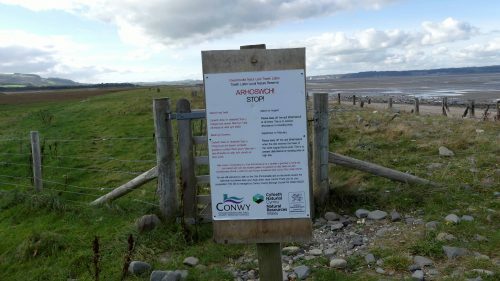 It asks that from March-August: Please keep off the spit (Shell Island) at all times. This is to prevent disturbance to breeding birds. 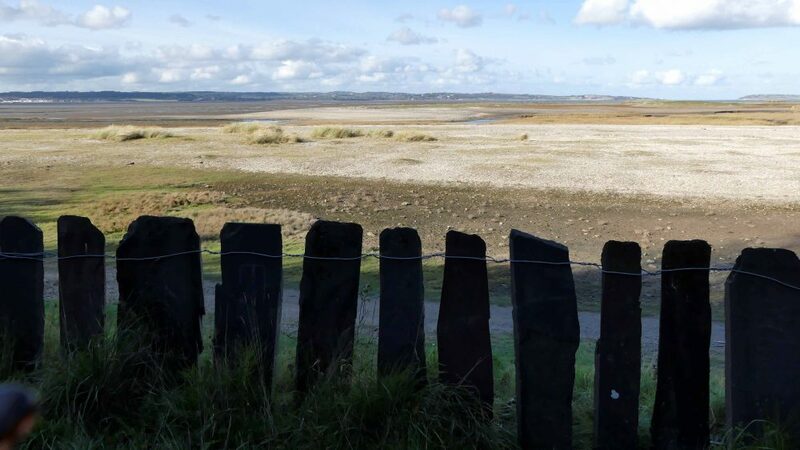 September-February: Please keep off the spit (Shell Island) when the tide reaches the base of the white-topped fence post. 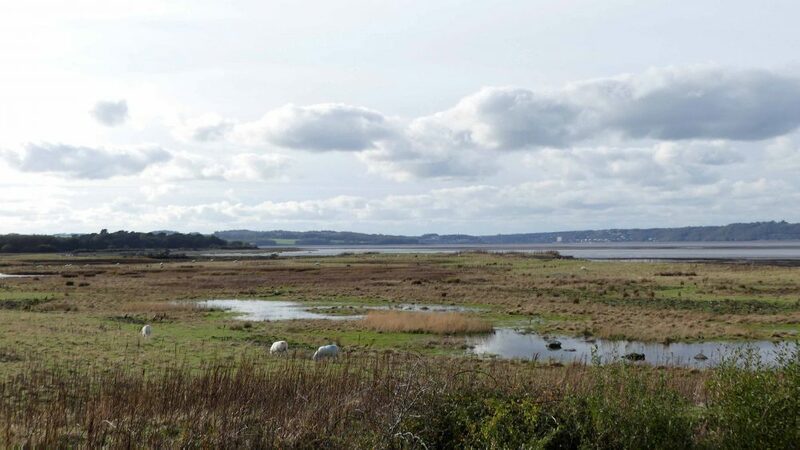 This is to prevent disturbance to roosting birds at high tide. And another plea to keep dogs under close control. 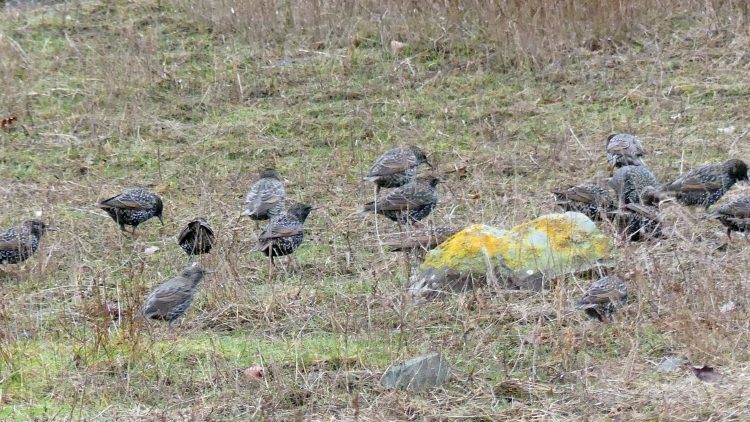 It took a few minutes for me to realise that there was a large flock of ducks on the ground in front of me, but to be fair you can see how tiny they were in the landscape and they were moving very slowly if at all. At times like this I know I should carry binoculars. 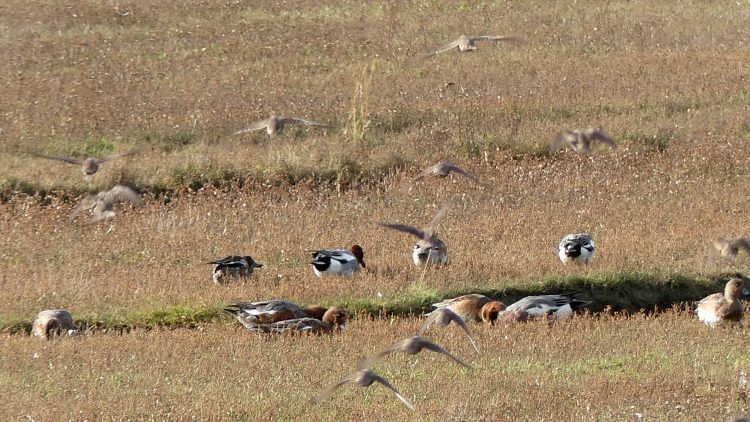 But with the camera I could see there were what appeared to be two large flocks, separated by an inlet and that they were Wigeon. 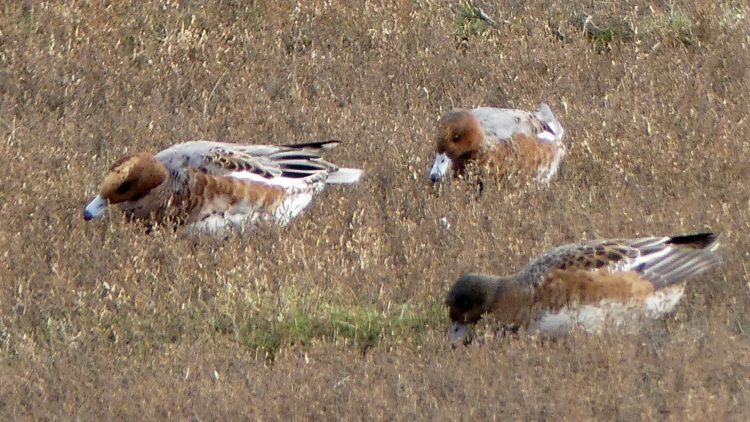 Wigeon, or Eurasian Wigeon Mareca penelope, are our largest native dabbling duck and unusual amongst ducks as they often graze on grass like a goose. 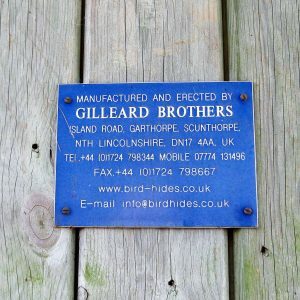 They are the most numerous of the overwintering species: the BTO quote an estimate of 440,000 pairs throughout Great Britain. There must be several hundred here. Intent on grazing they were lovely to see, but tricky to get good views of, so I left them to it, hoping for better views later. 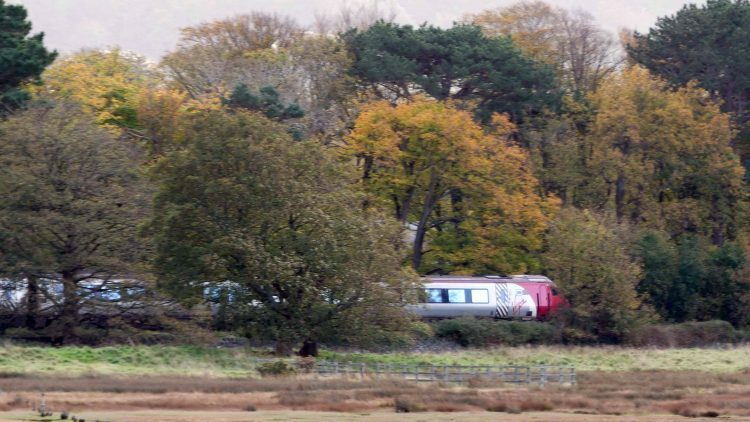 13:07 – A speeding Virgin train bound for Holyhead shows how close the train tracks are to the reserve’s boundary. 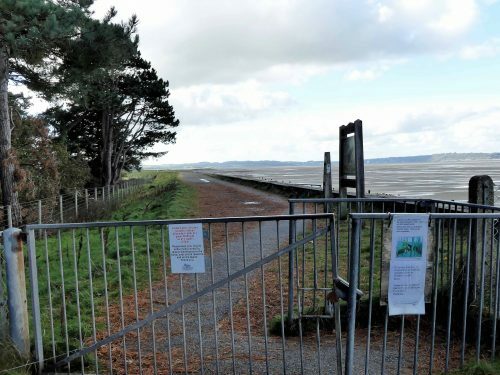 There was a sign to say the coastal section of the path was closed. There were people peering over a plastic barricade to see why that might be. I decide to heed the sign and continue around the alternative more inland track. 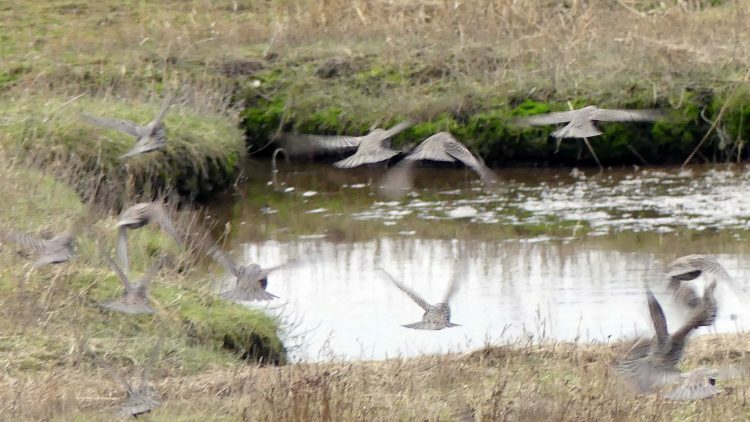 As I was about to move on, a flock of noisily-chatting Starlings descends on the bank and lands in the long grass. 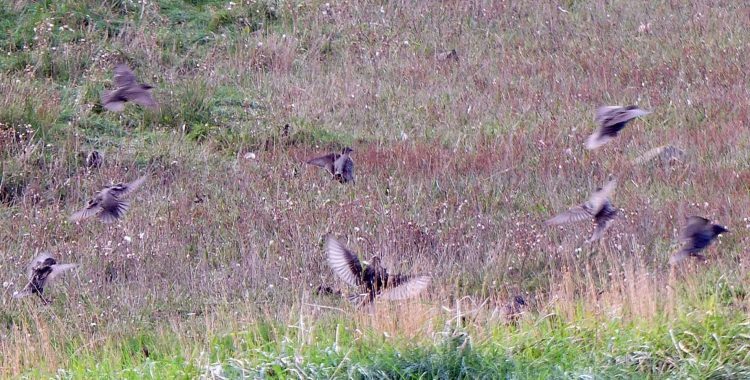 They can’t seem to settle and flit around restlessly, seeming to be squabbling amongst themselves. 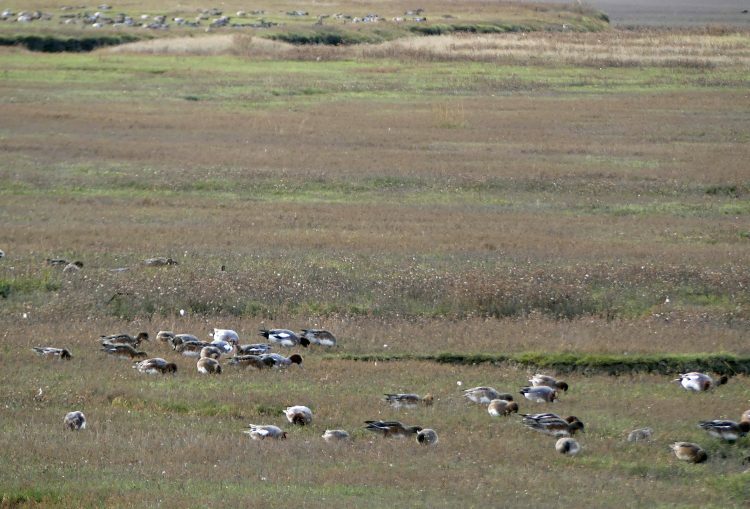 Small groups of birds dash off in varying directions, some heading off over the heads of the intently grazing ducks, who barely give them a glance. 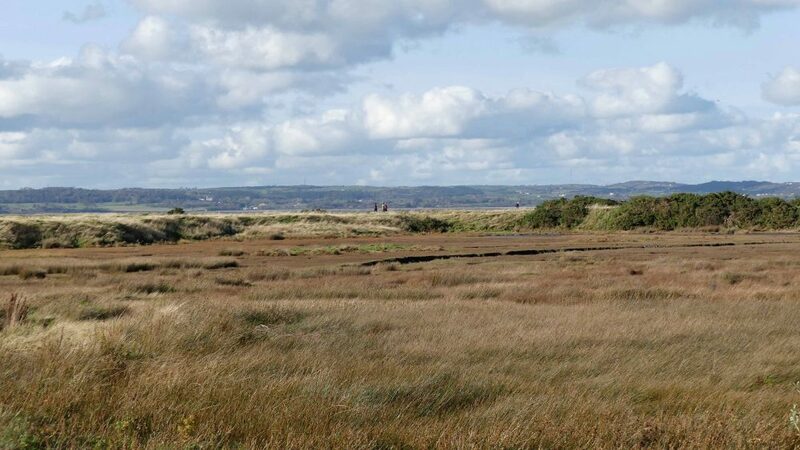 The track I’m heading for sweeps around the marsh in front of the line of trees. 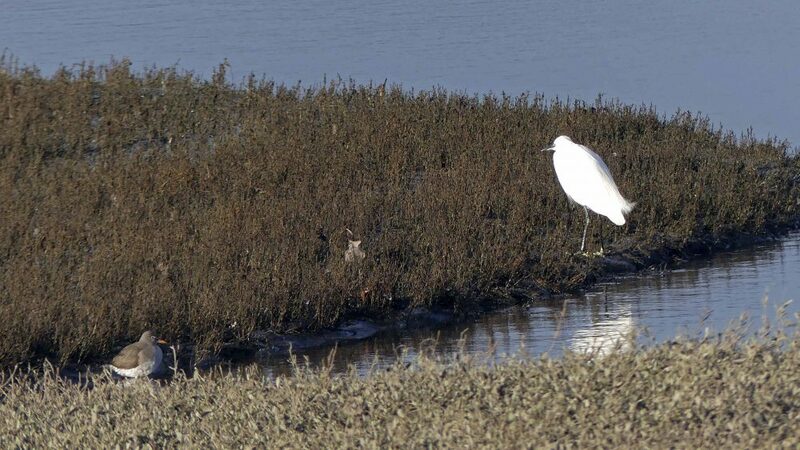 I spotted a single wading bird, again regretting my lack of binoculars as the sun directly on camera lens. It seemed quite large but perspective is a funny thing and it didn’t have much in the way of identifying features. 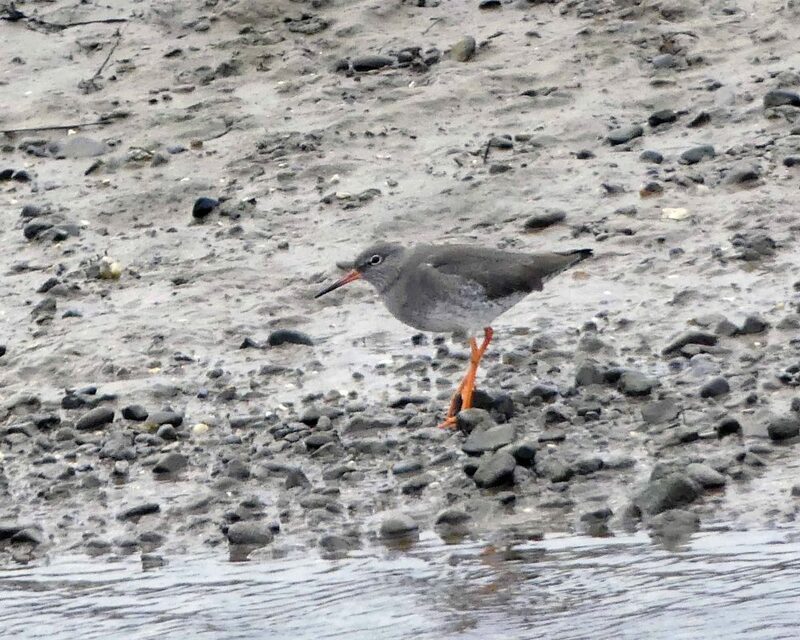 Most likely another Redshank. 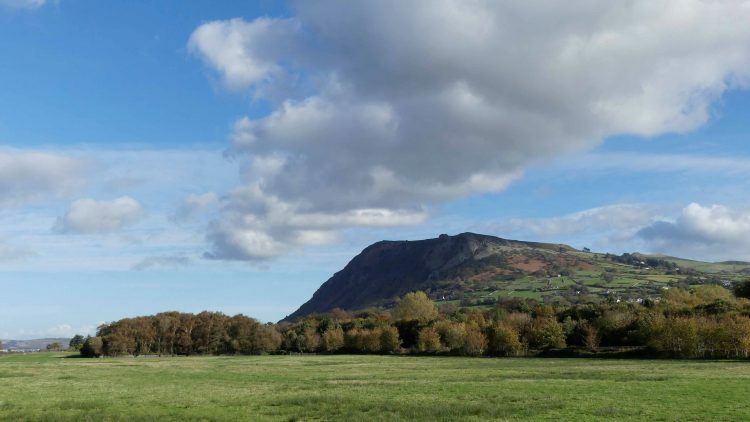 13:14 Looking back a nice view of Penmaenmawr Mountain partly shadowed by a large passing cloud. Across the reedy marsh to the other path it seems quite a few people have ignored the sign advising that the route is closed. 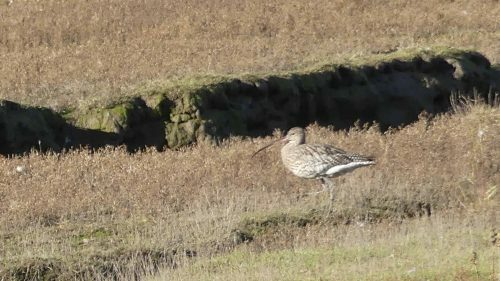 Whilst looking in that direction I spotted a Curlew. 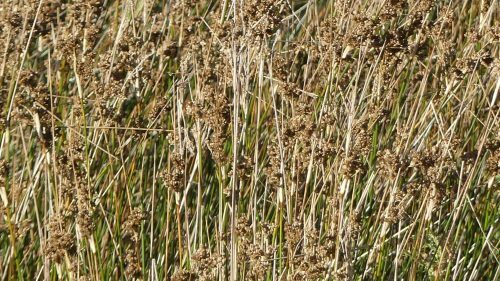 and have a closer look at the reeds too. 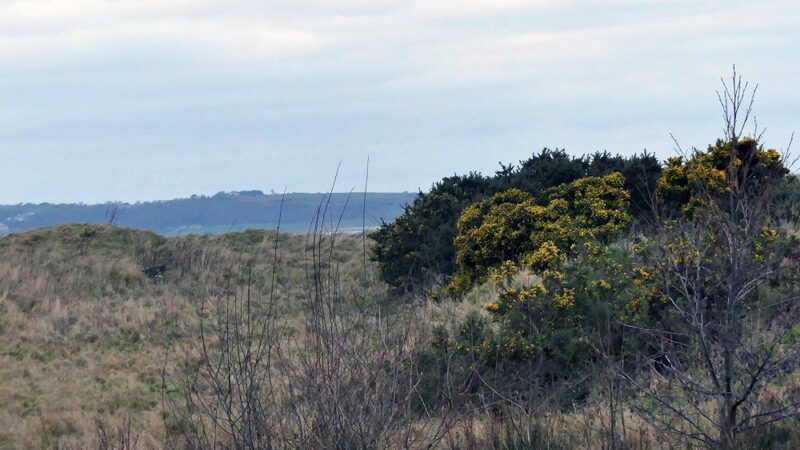 A flowering Gorse brings a touch of gold to the landscape. 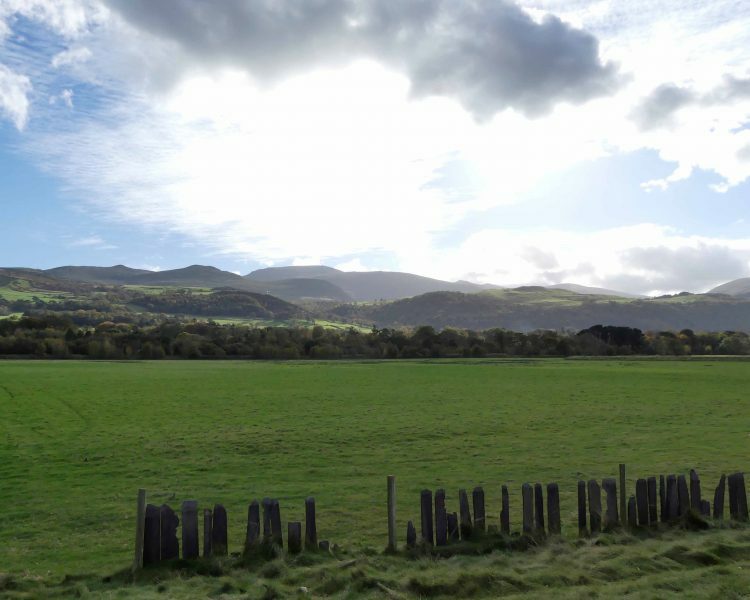 The fields and farms in the background are on Anglesey. Towards the end of this section of the path which is damp and shaded by trees I was surprised to find Yarrow still blooming. 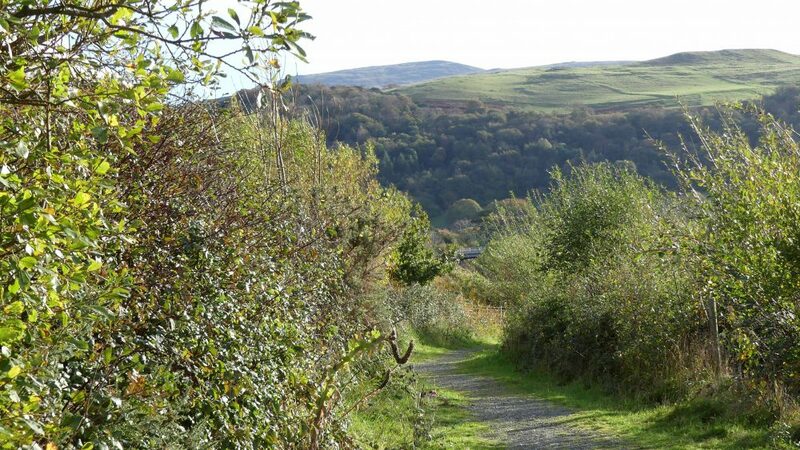 You can choose whether to follow the grassy path around and back to where you started (the track that’s supposed to be closed), or follow the slate fence around to continue on the Wales Coast Path as indicated by another signpost. 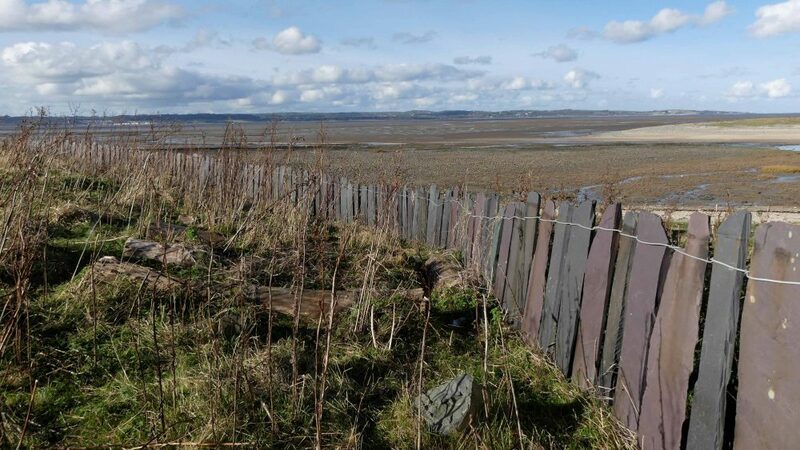 I decided to carry on a bit further and have a quick look around the fenced-off woodland of the Morfa Madryn Reserve before heading back.